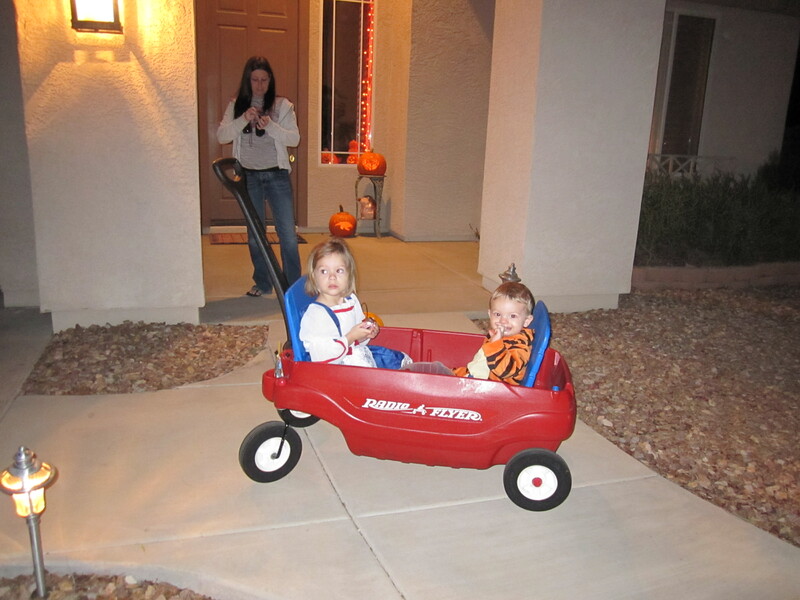 I started Talon’s other blog with a Halloween picture so I thought I should start his One year old blog with one as well. 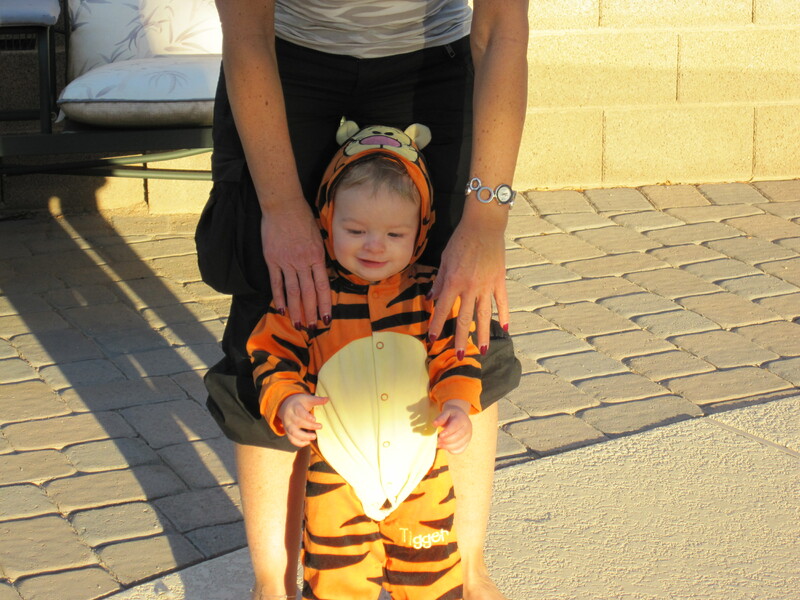 Here is Linda with Talon in his Tigger costume. 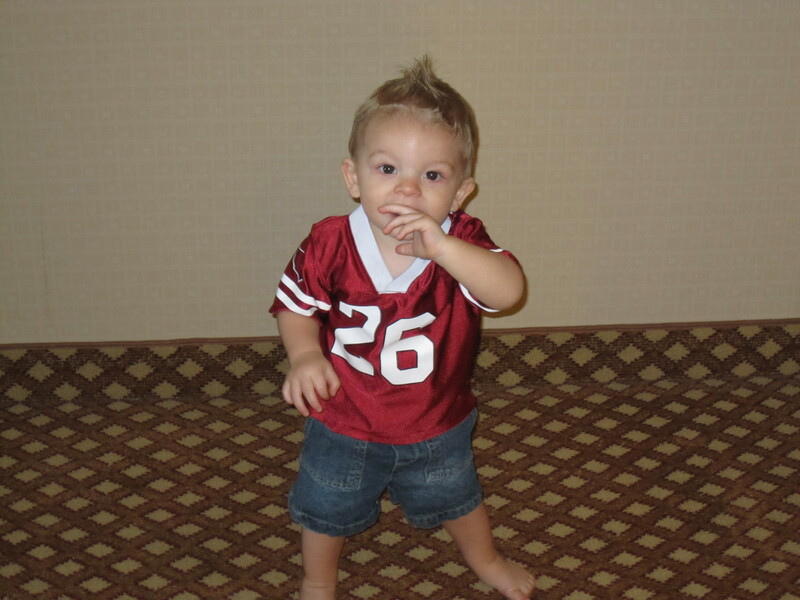 Talon standing in our hotel room in Avondale showing us how well he can stand on his own. He will take a few steps now and then but after that he’s on his hands and knees moving faster than I can move. I think Linda has taken me off the baby sitting duty because Talon is faster than I am. 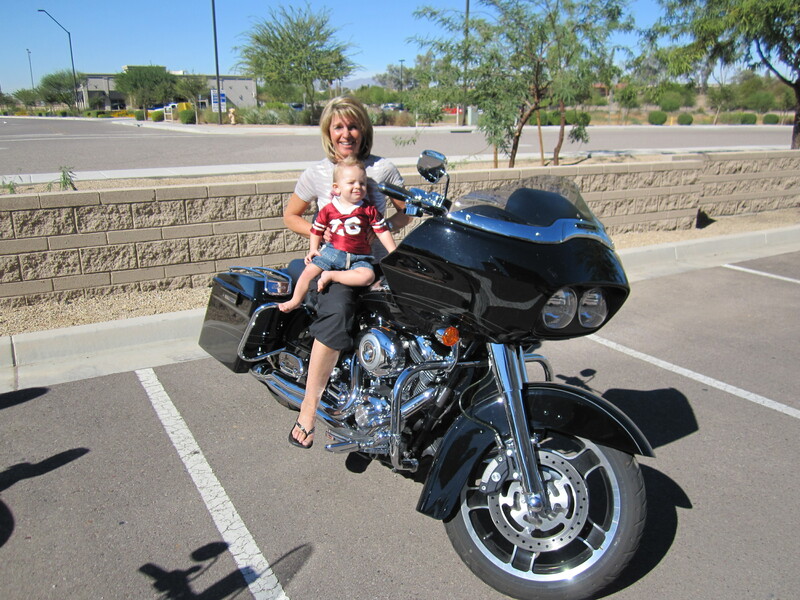 Talon getting comfortable with the “new ride” and loving having a hot babe on the back even if it is his grandma. Talon likes to push his Harley more than he likes riding it right now. Holloween trick or treating it was so warm and he loved the wagon, and sucker. 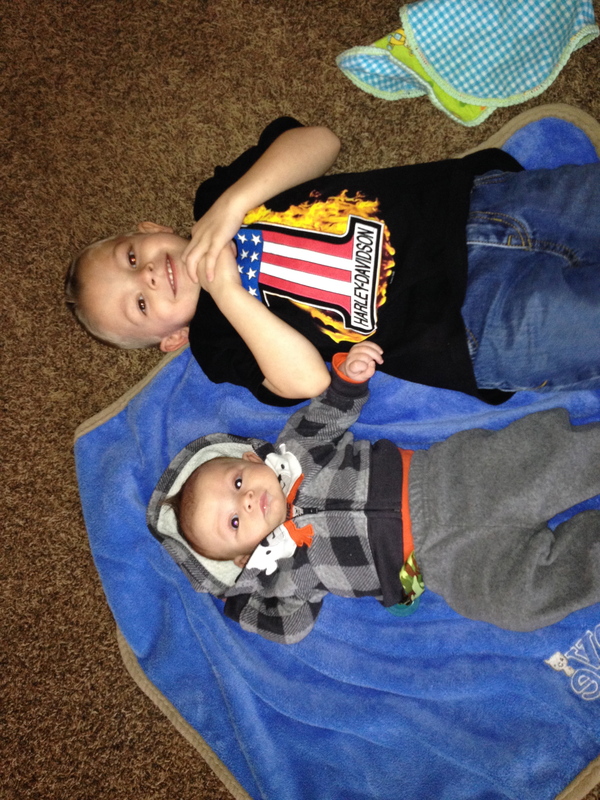 WOW try taking a sucker way from Talon now…. The fight was on when Tonianne wanted to take it from him because it was getting to small and she thought he might choke on it. Loving the Harley clothes He should be the new Harley Davidson kid model. 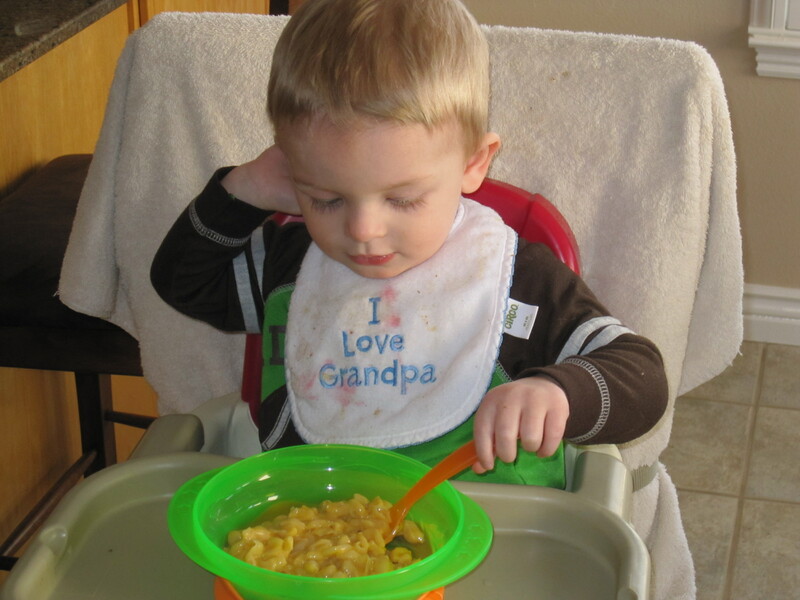 He is such a happy boy when he’s aroung Grandpa “C”. 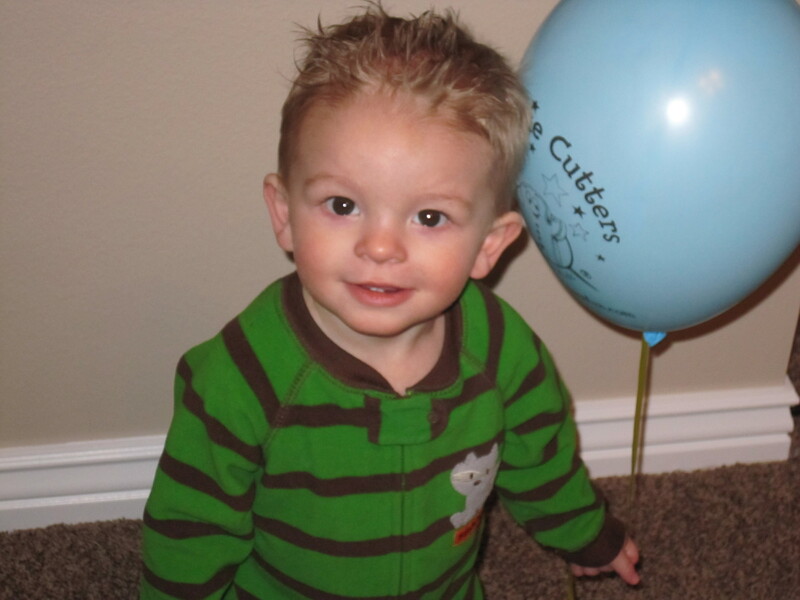 11/18/2010 is a special date because I just came home from a business trip and Talon said his first word to me “HI” and he waved. So cool!!!! Now he says Hi to everyone. If I remember correctly I think that was Tonianne’s first word as well. Talon is now walking pretty well in fact he walks so well he can carry a basketball that is just about as big as he is. 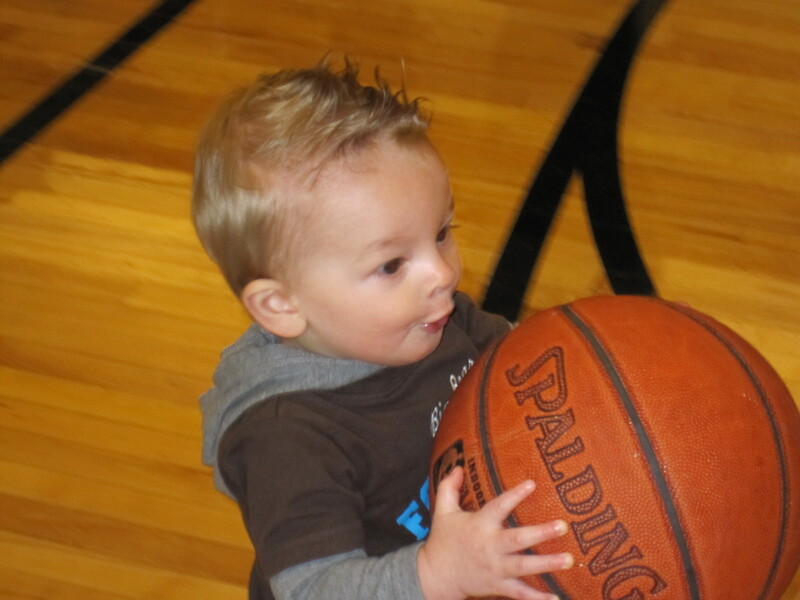 Talon loves any kind of ball. 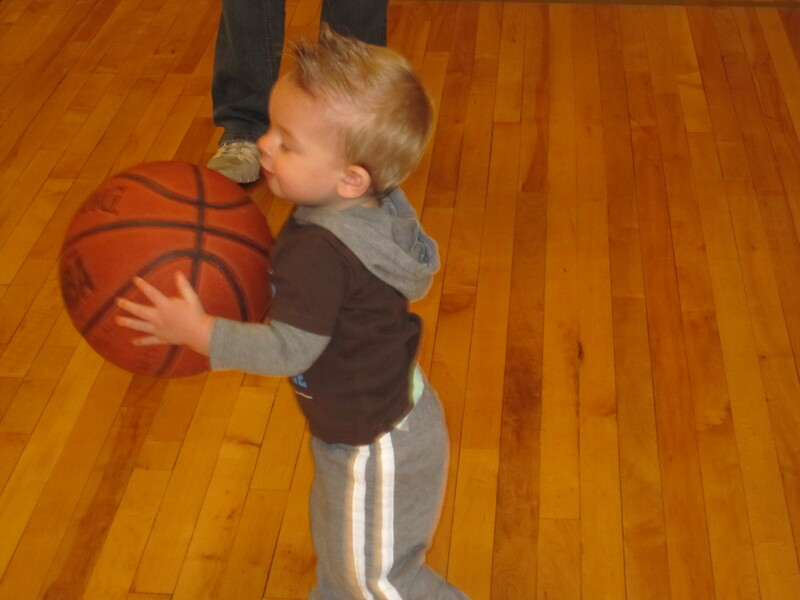 We were at Linda’s family Christmas party and he had to play with the basketball all night. Working on his Jump shot !!! 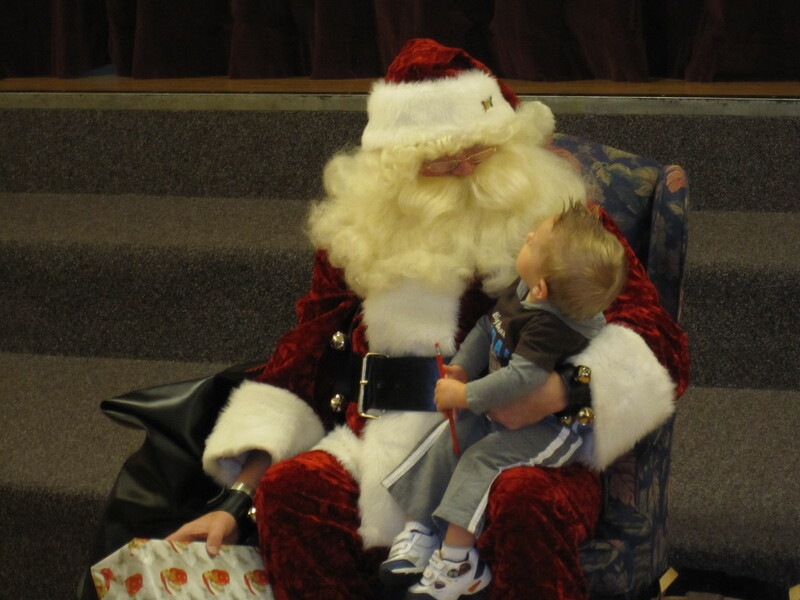 Talon loved Santa we thought he might because he seems to like everyone he meets and we were right. 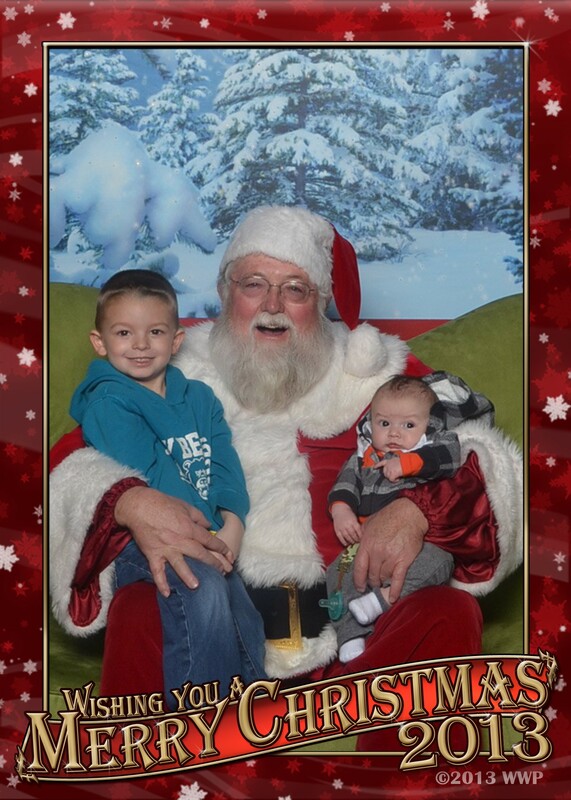 He could have sat on Santa’s lap all day. 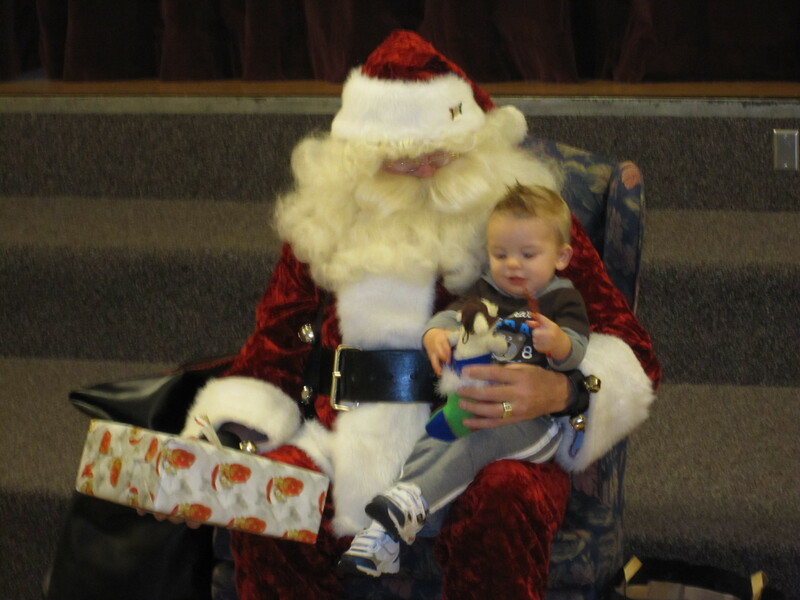 I’m pretty sure Talon was asking Santa for a new Harley!!! 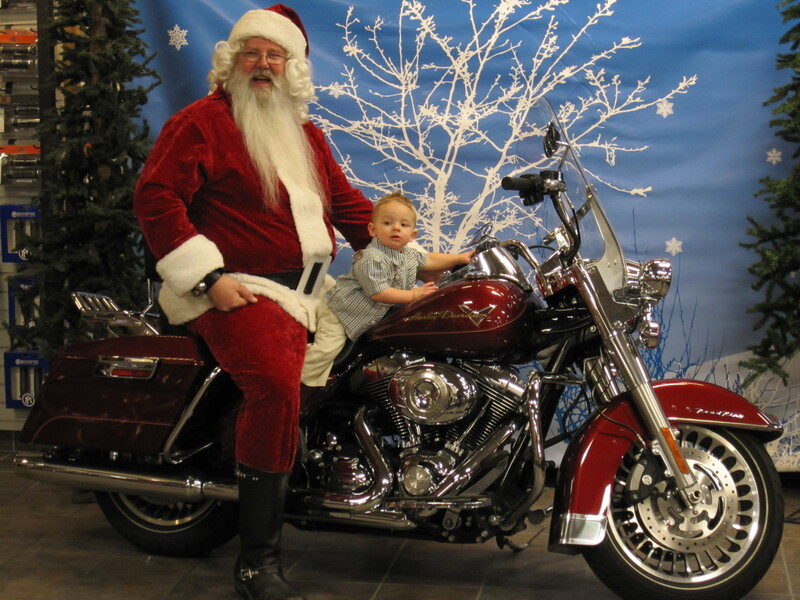 It took us about five minutes to take the picture because Talon just wanted to look at Santa and the cool motorcycle, he did have his hand on the grip. Talon knows what he’s doing. 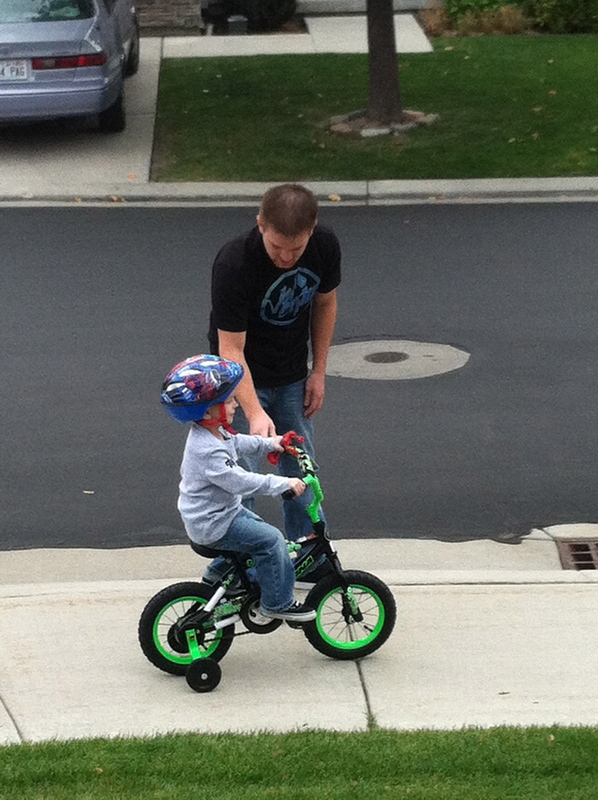 As soon as his legs are long enough he will be ready to ride!!! 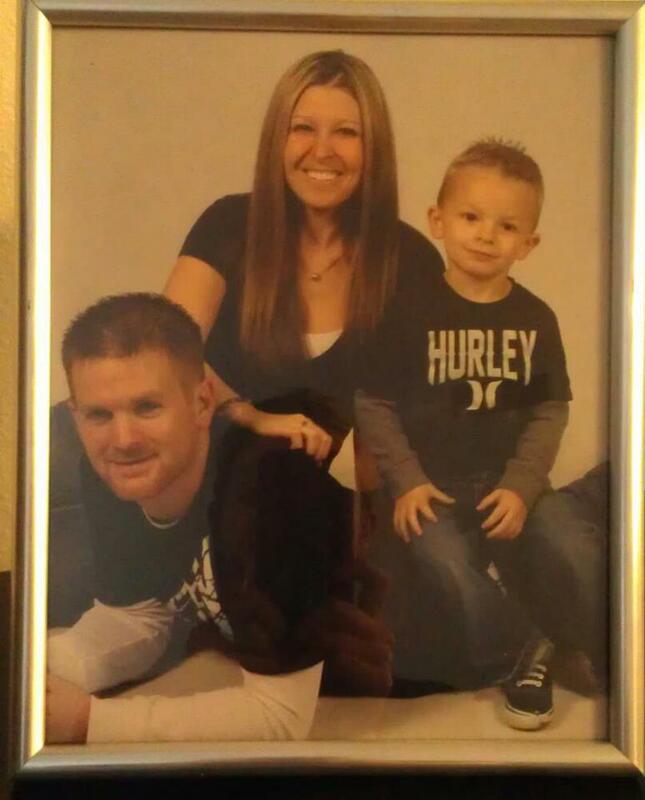 Talon’s a player he now has his first girlfriend. 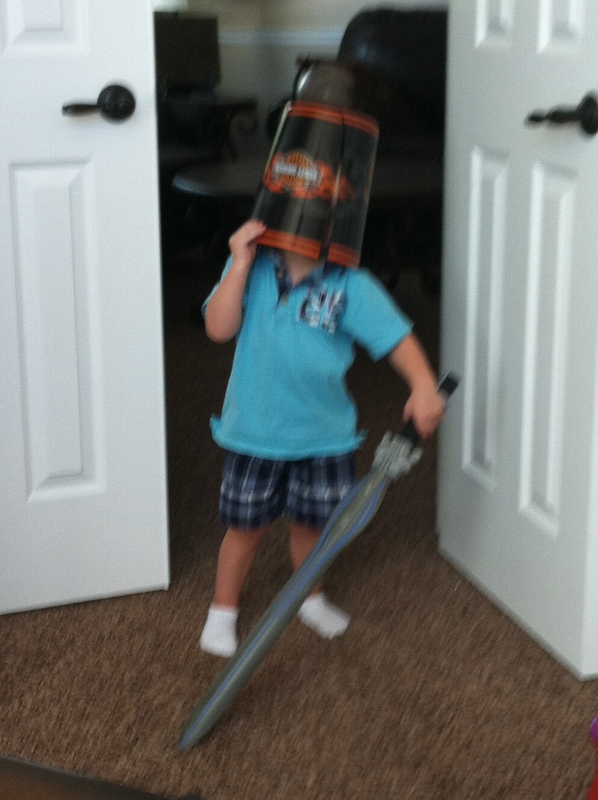 Skye has to do everything Talon does…. 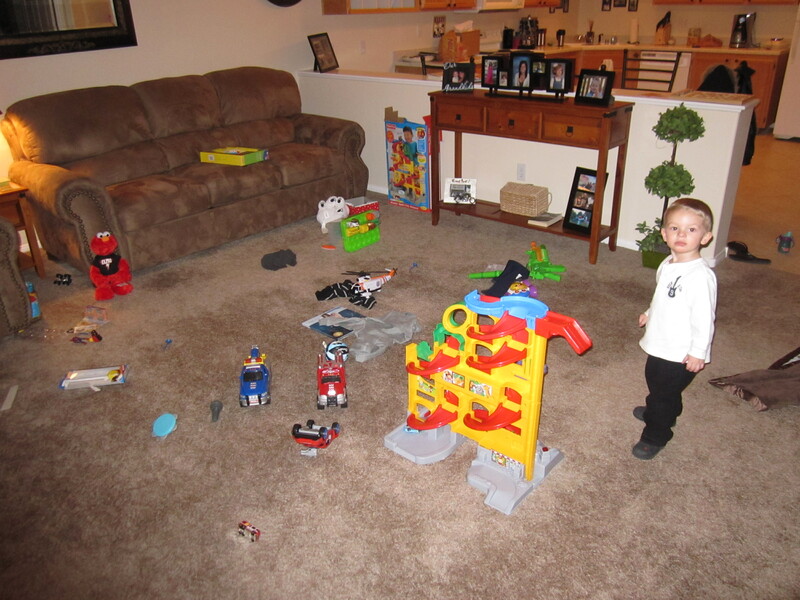 Well accept playing with his toys, Talon’s still not so keen on anyone playing with his toys. 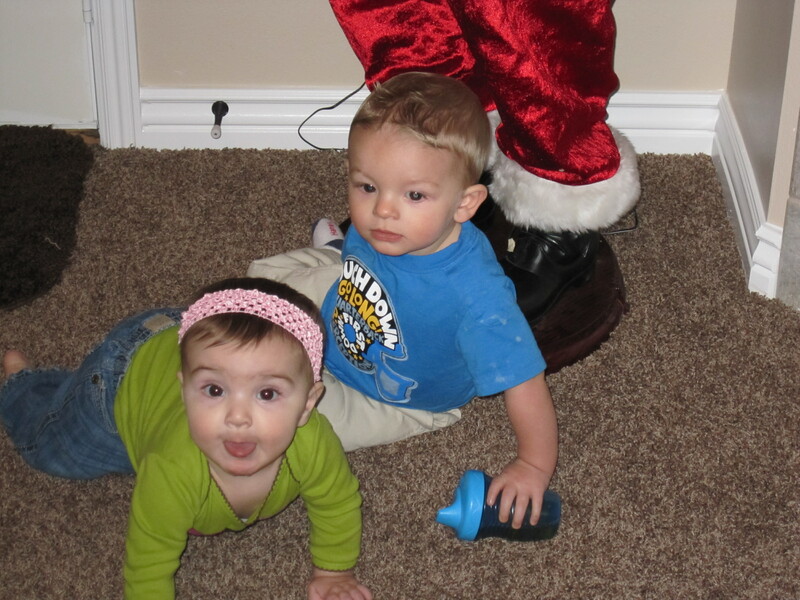 He did give her a couple pointer on crawling that helped her out. Now I know things have gotten out of hand Talon has taken over my chair…. This cannot be good. Talon fresh from the barber. He is a good looking boy. It’s now March and Talon is trying so hard to communicate he can say a few words but I think it will very soon he start talking and then I have a feeling he will not stop. He is also started to feed himself. 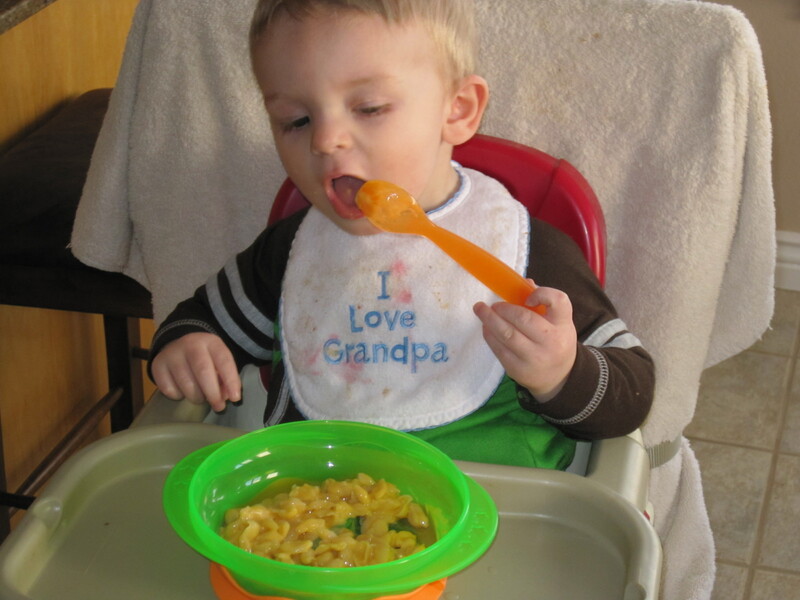 Also notice which hand he uses to feed himself. 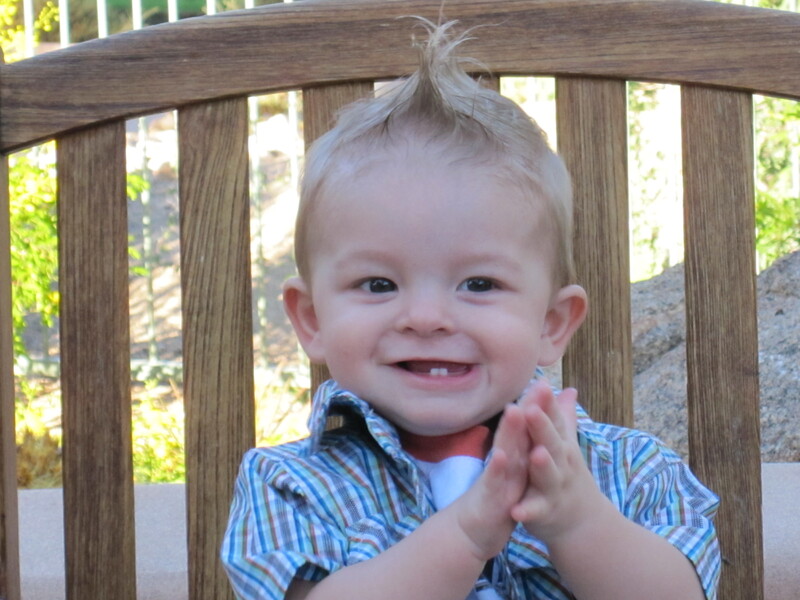 That’s right he’s going to be a lefty…. I knew he was going to be smart the first time I laid eyes on him. Brenda and Roger have been great helping Toninanne with Talon while she’s working, everyone knows how much Talon loves balls. 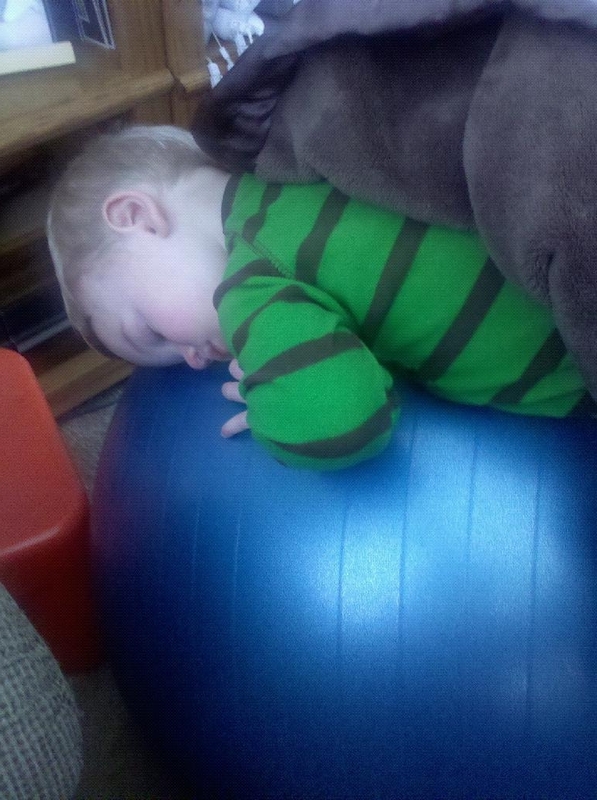 These are great pictures of Talon playing on the ball and just fell a sleep on it so Brenda put his blanket on him. Brenda had to hold the ball with her foot so he wouldn’t fall off. He was out. 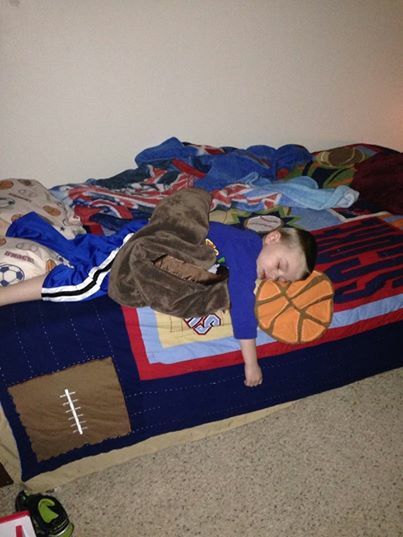 You have to love it when you play so hard you just fall asleep where ever you’re at. 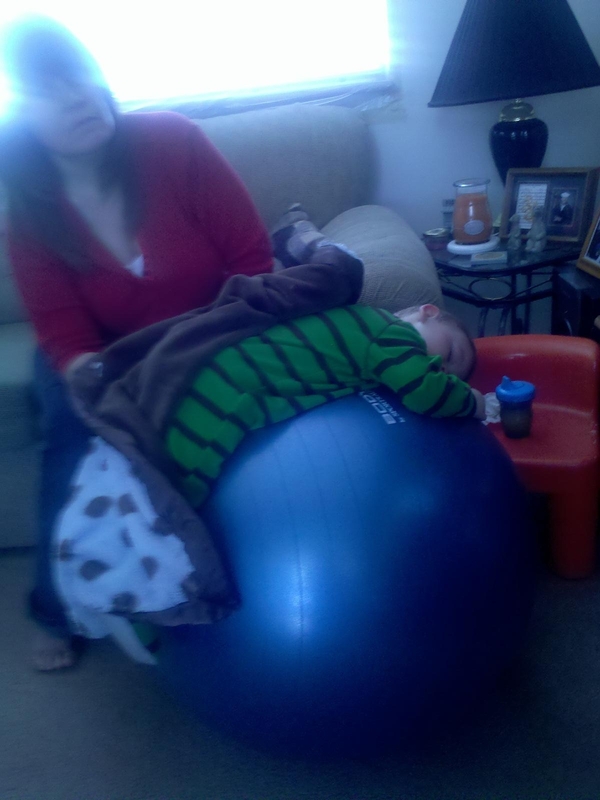 Wait that sounds a lot like Talon’s Grand mother Linda she can sleep anywhere so I guess he must get it from her. 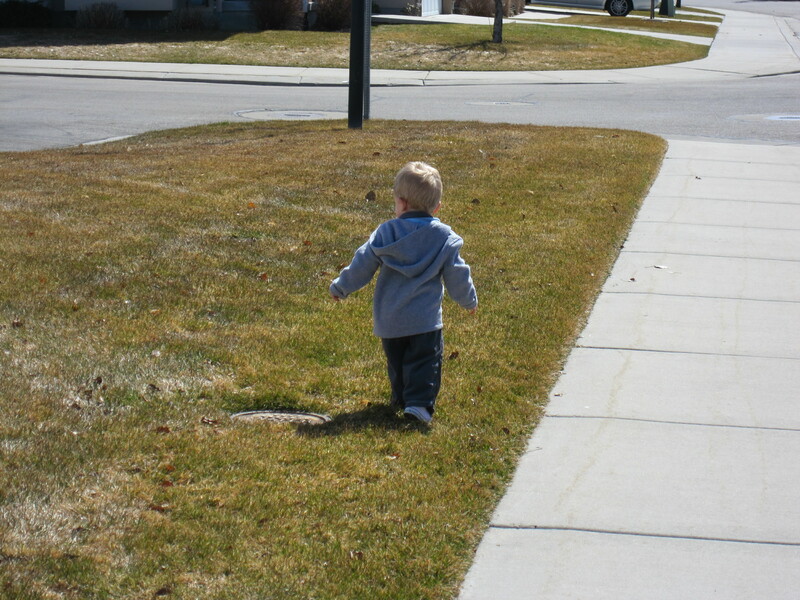 It was finally warm enough to let Talon play outside and boy did he like it as soon as his feet hit the ground he was on the run. Talon’s mind is always going here he is wondering why dogs think this is so inteteresting. Talon really does like going outside in fact he loves it so much just try bringing him back in doors dang he can scream loud. This is a great picture. We went over to my mother’s house and Talon would go outside the push his nose up against the screen and laugh like crazy. 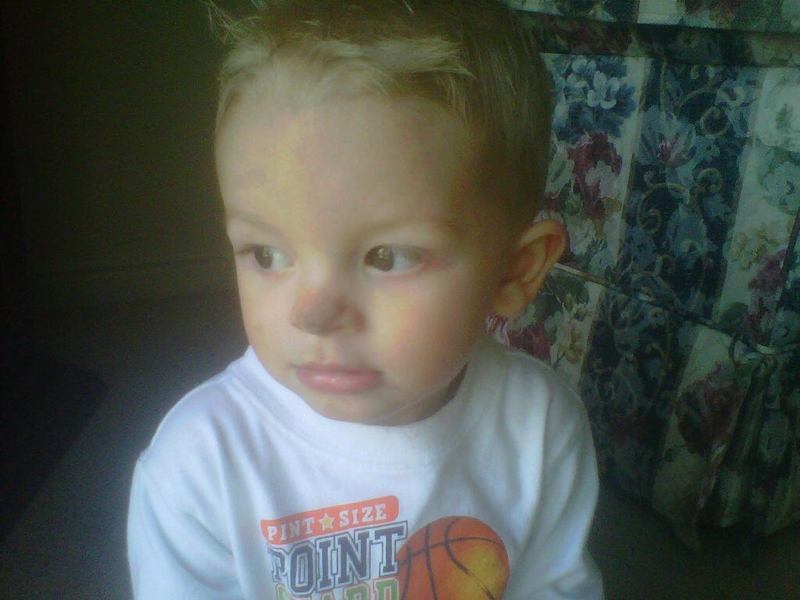 What he didn’t know was how dirty the screen was so he got this big dirty spot on his nose. 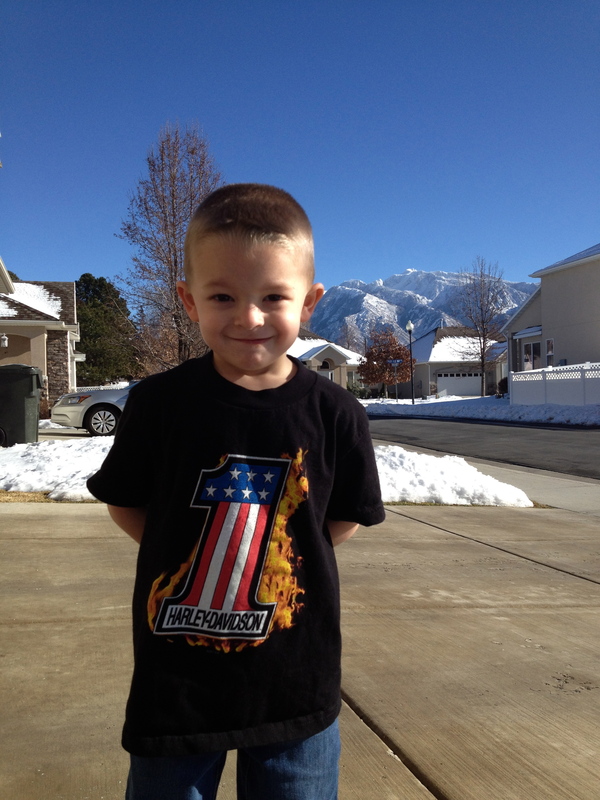 I made him sit down so I could take the picture, you can see it in his eyes this kids want to be outside, we cannot wait until summer. I had to post this picture of Tonianne and Talon sleeping at the condo in Mesquite. The good news for Tonianne is Talon likes to sleep in. 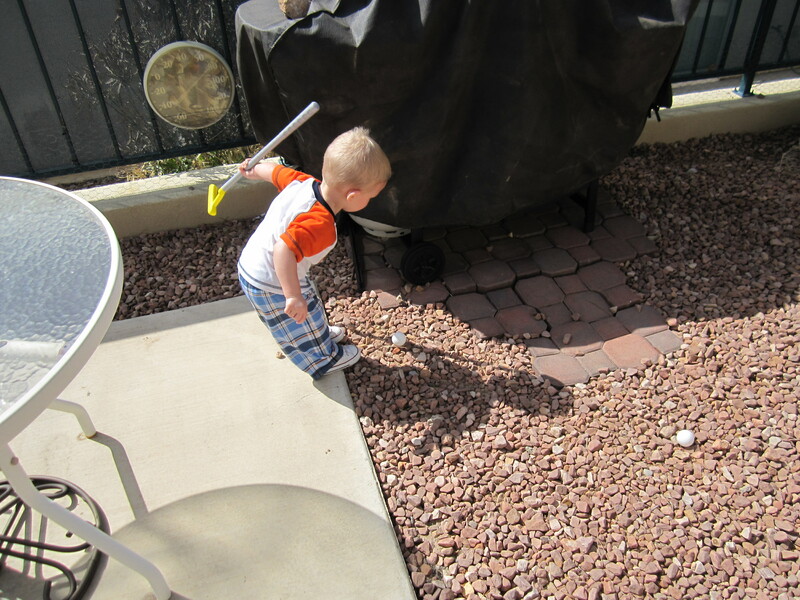 Talon got a new golf set for Easter as you can imagine he had to hit the balls all over the back yard. As you can see from his form Talon has the hardest part of the game mastered. “Head Down” “Eyes on the ball” We just need to work on his swing now. He is just so much fun. 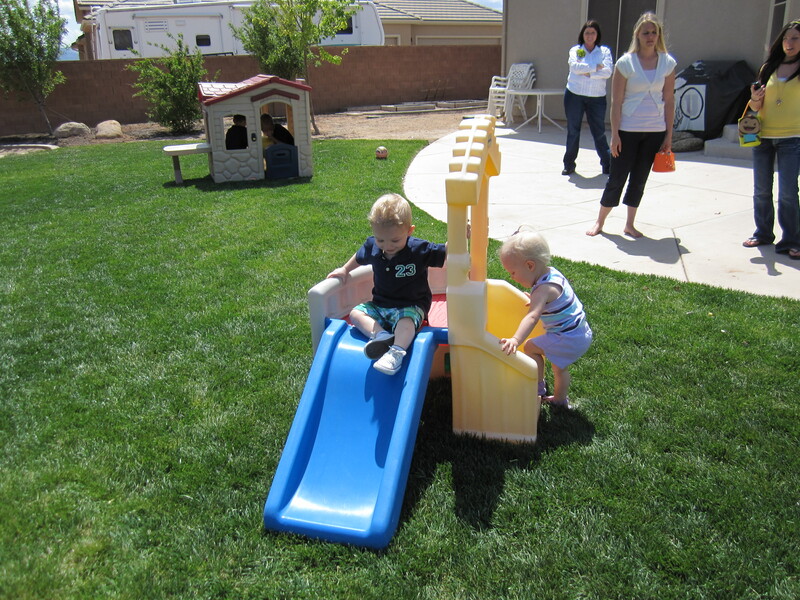 We went over to Todd and Alisa’s house in St. George for dinner and the Easter egg hunt. Alisa made my favorite pie. After dinner the hunt was on but as soon as Talon saw all of the balls and toys in the backyard he was not so interested in the eggs any more you would have thought he was in DisneyLand with everything to do. 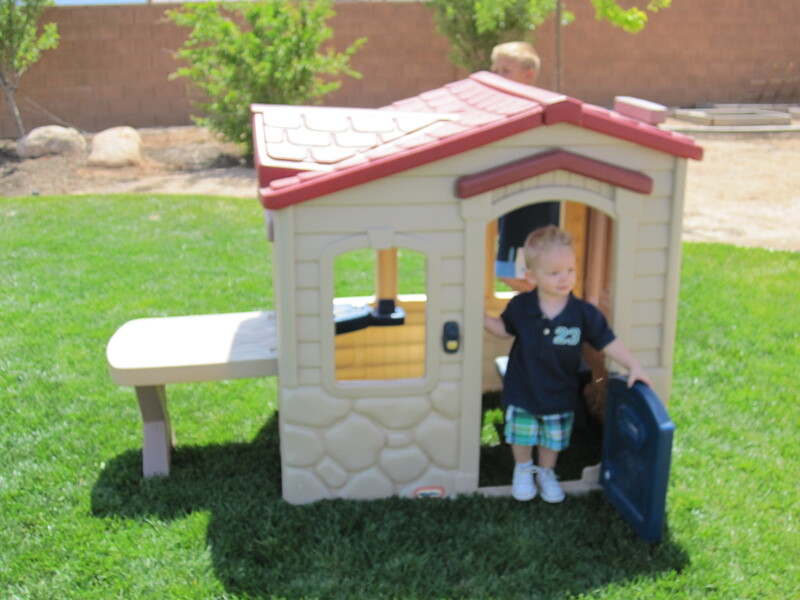 He liked the play house a little to much hmmmm. For not being around a lot of kids he sure does play well with them. these two just kept on taking turns going down the slide. Talon was good with her because it took a few more seconds for her to climb the steps and then sit down, Talon would just wait and take his turn. Talon racing Austin…. it was close but Austin could really move on his scooter. Talon blamed it on “home scooter advantage”. 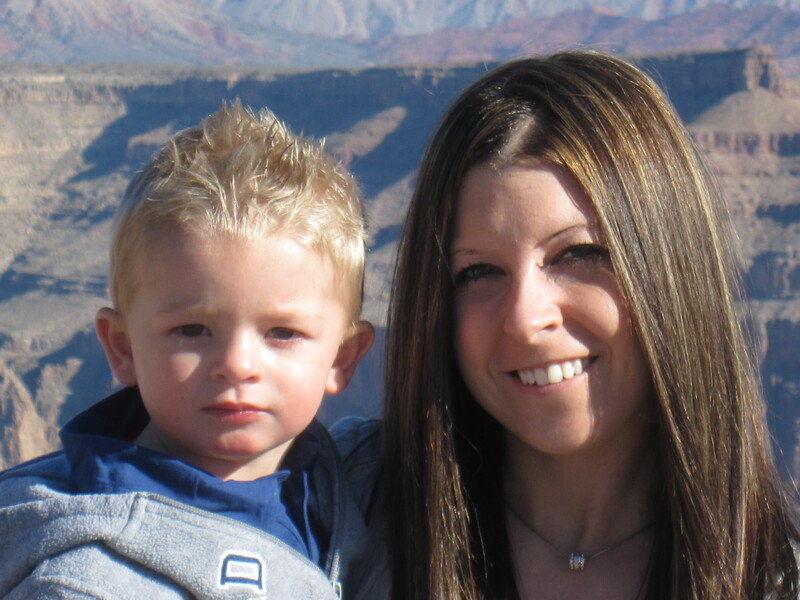 It was a great Easter for Tonianne and Talon although it was a little sad that Frank and his parents never did show up to see him, the good news he’s still to young to think about that right now. 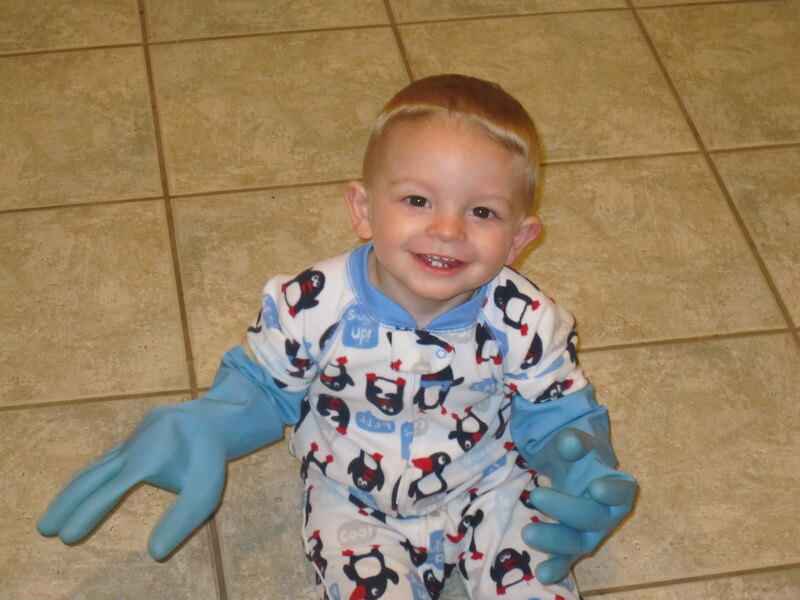 Talon has been here long enough that it can’t be counted as just a long visit so we have put him to work doing dishes. Here he’s telling Linda to back off he will get to pans after he gets the glasses washed. 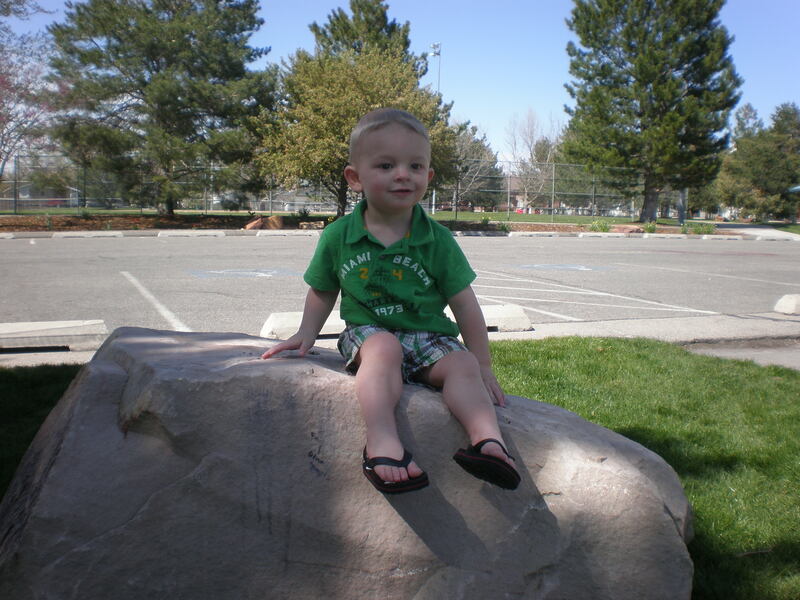 Now that it’s warm outside Talon has to be outside all of the time, Tonianne got him to sit still for a minute to take this picture of him on the rock a the park. 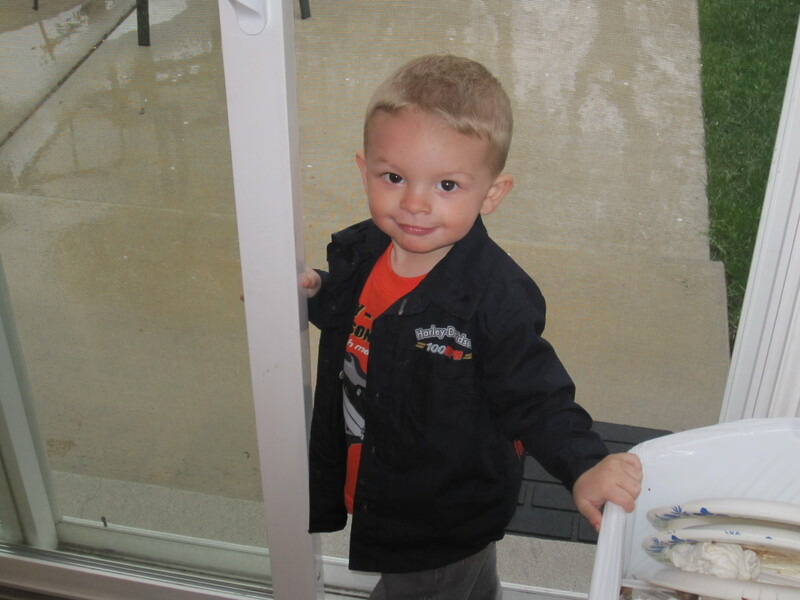 Here Talon is with his new Harley clothes on. He thinks he’s a model. 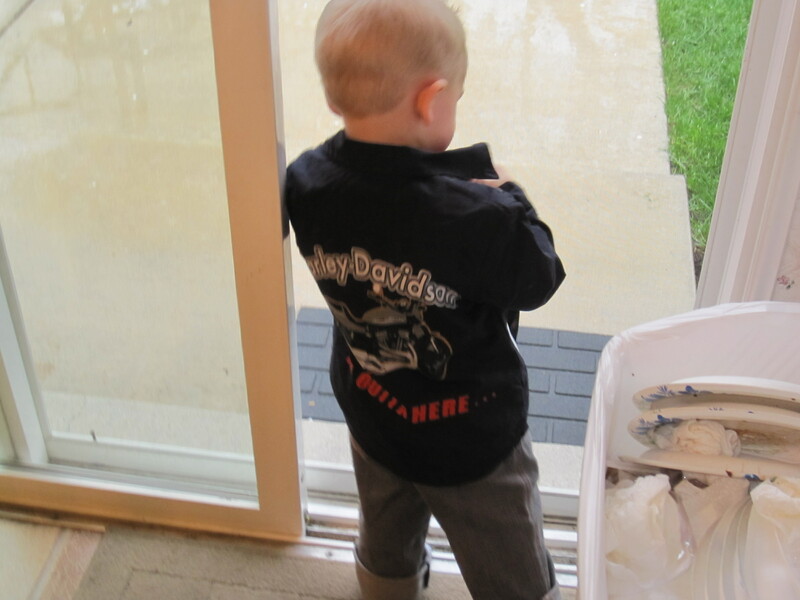 It was raining outside so here’s Talon just looking outside and waiting for it to quit so he can go out and play. Talon thinks he’s part monkey and sometimes I think he is. 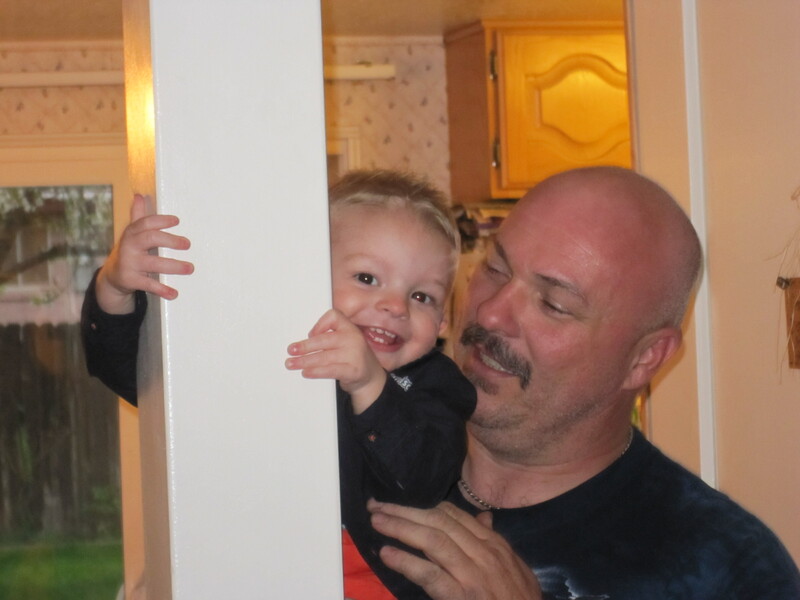 This is a great picture of Roger and Talon. He made it all the way up the pole!!! 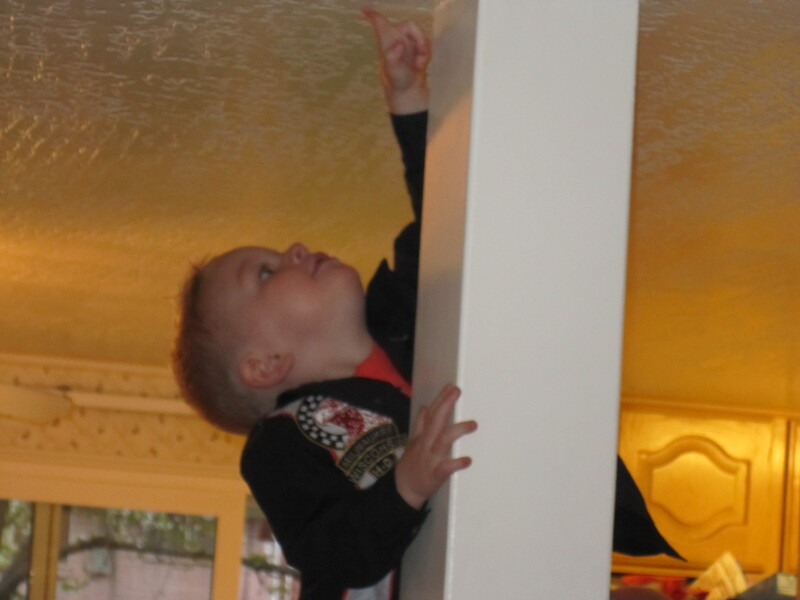 He’s going to ring the bell and slide back down I think he has the new worlds record in house pole climbing. 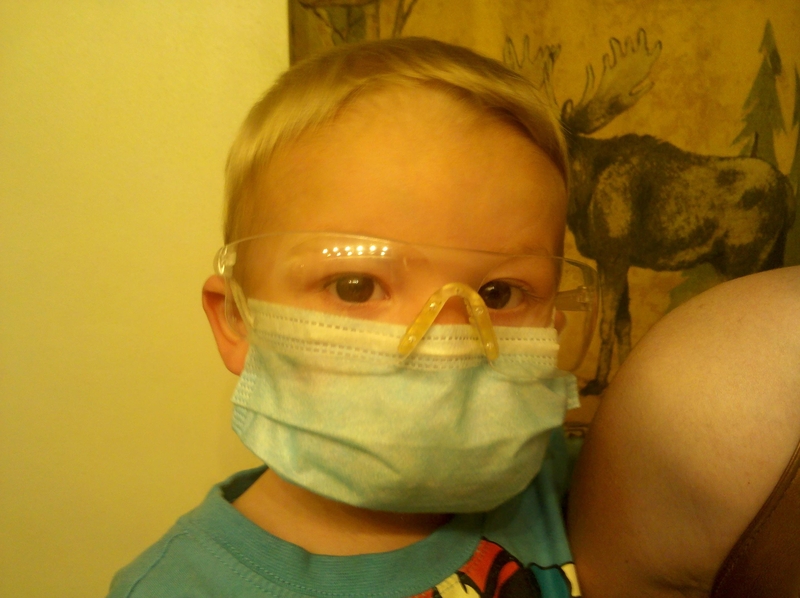 Talon is taking the whole playing Doctor thing a little to far I think. 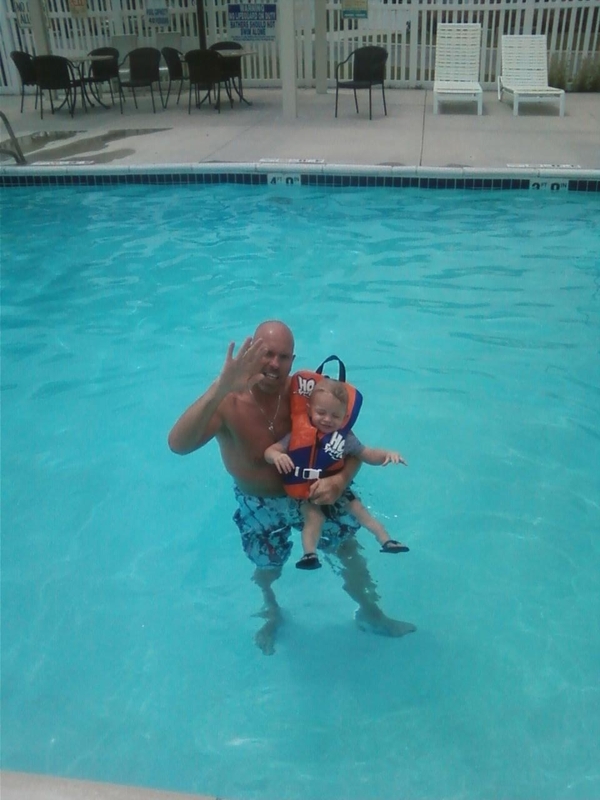 Talon and “Pa Pa” in our pool. Talon would not get in the pool in fact he wouldn’t even put his feet in the water. But you add a little Pa Pa to the mix and he was jumping off of the side of pool. Now Linda and Tonianne have to be very careful because this kid has no fear he jumped in one time head first and I had to pull him up. 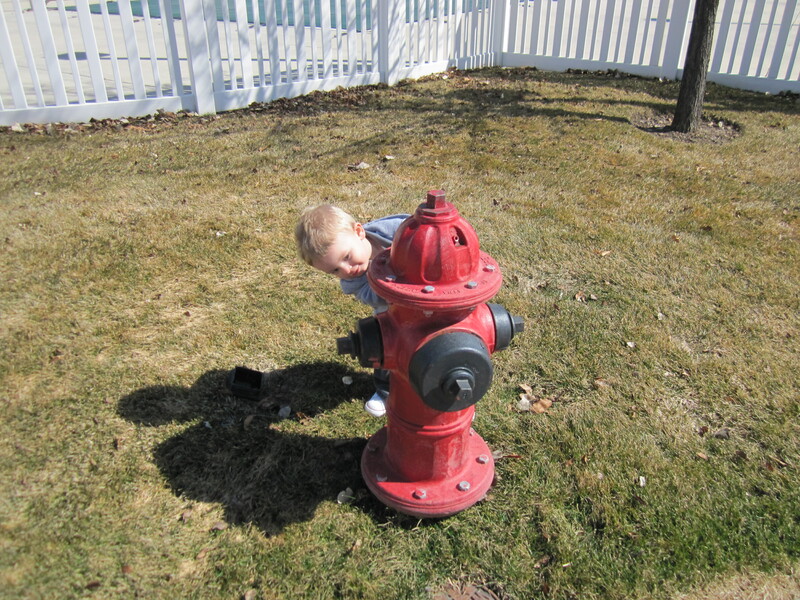 After spitting out all of the water he was ready to do it again. He is all boy!!! 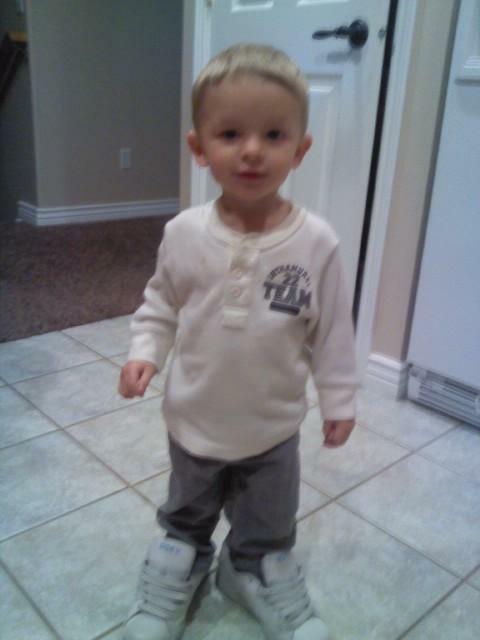 Here’s Talon with his Mom’s shoes on. Funny thing is Talon doesn’t really like to wear shoes that much. But for some reason he digs his Mom’s or Linda’s shoes. 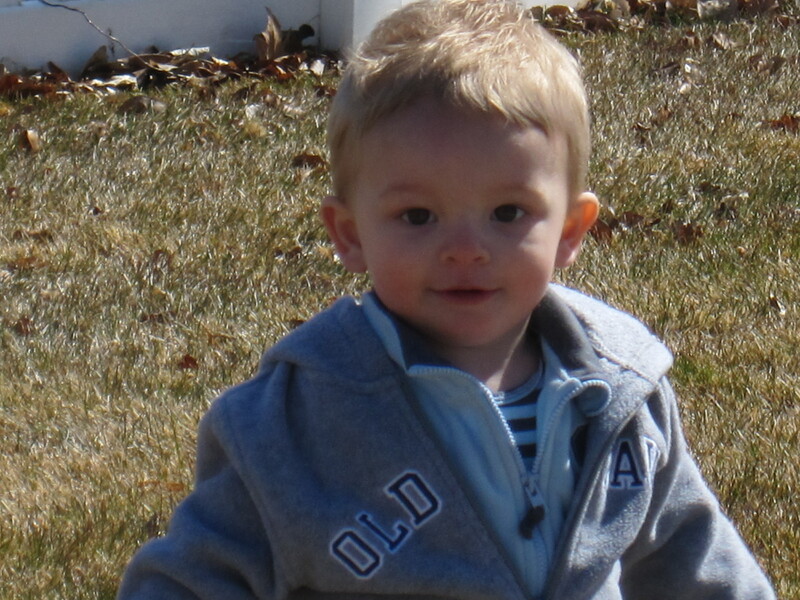 I put this picture in just because he looks so big and changing so much. He really is starting to look like a little boy and not as much as a baby anymore. 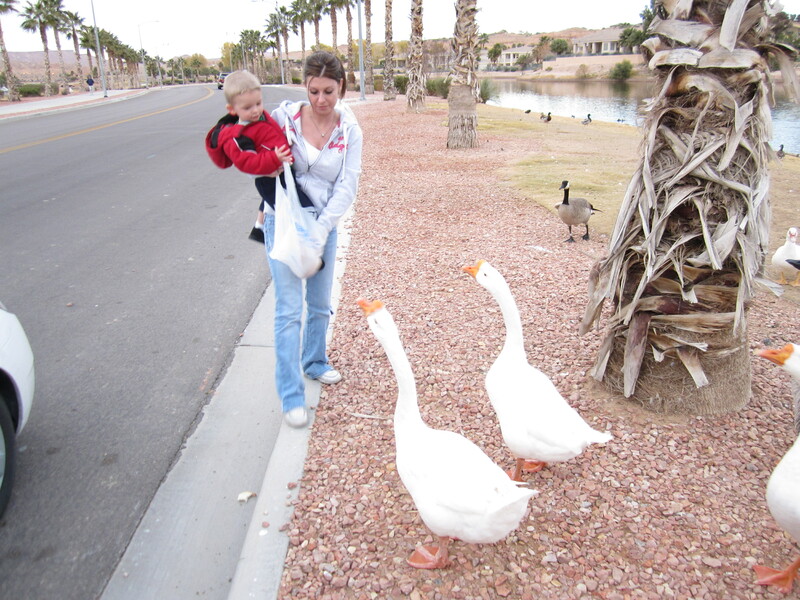 Toni and Talon feeding the geese in Mesquite. Talon was so funny as soon as put him on the ground to feed the ducks and geese you would have thought the ground was on fire the way he jumped right back up into my arms. 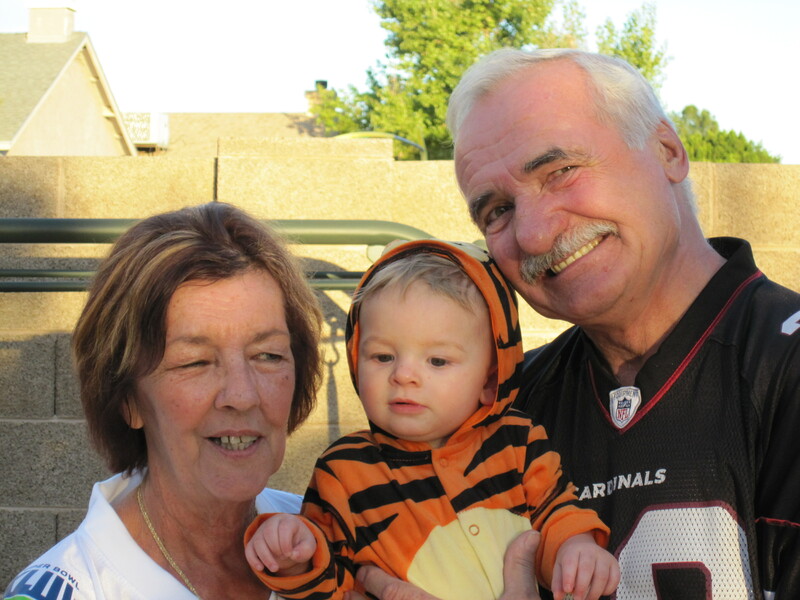 Frank and his Grandma Carol and Grandpa Bill met us in Mesquite while we were there. 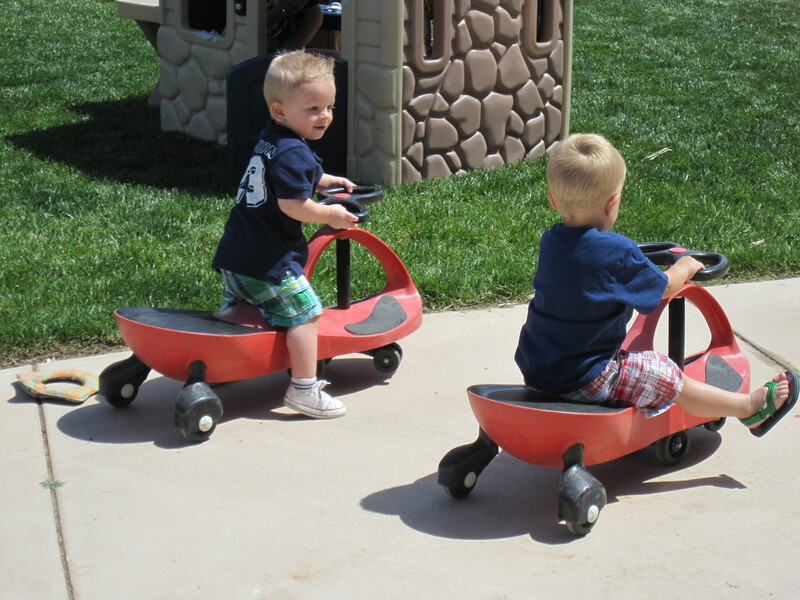 Here’s good picture of Frank and Talon at the park. 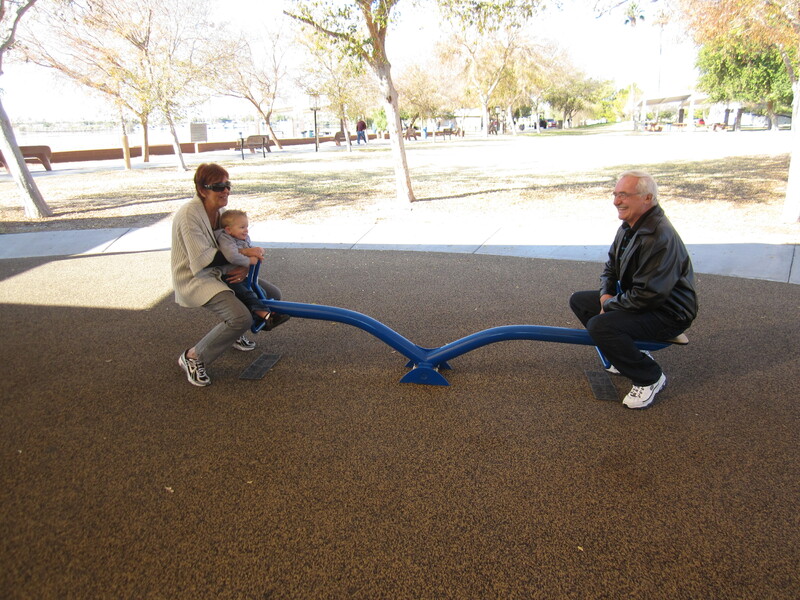 This is a great picture of Carol and Bill playing with Talon. Just click on it and you can see it better. 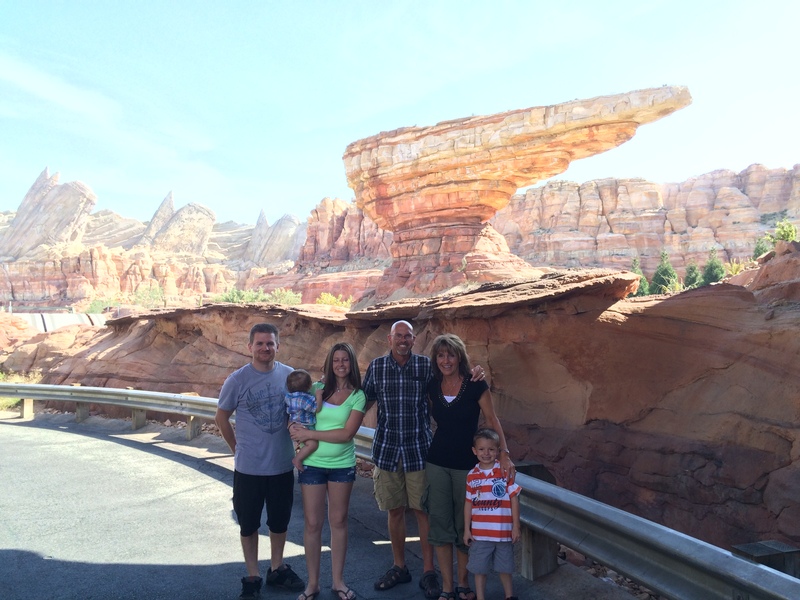 While we were in the area we drove over to the Grand Canyon and went to the Sky Walk on the West side. It was so cool but scary looking down 4,000 feet. This it Toni and Talon just after we took the walk. I think Talon is still in shock although he did fine it was Linda who had a few issuses on the Sky Walk. We all made it off safe and noone cried so I guess that is success. 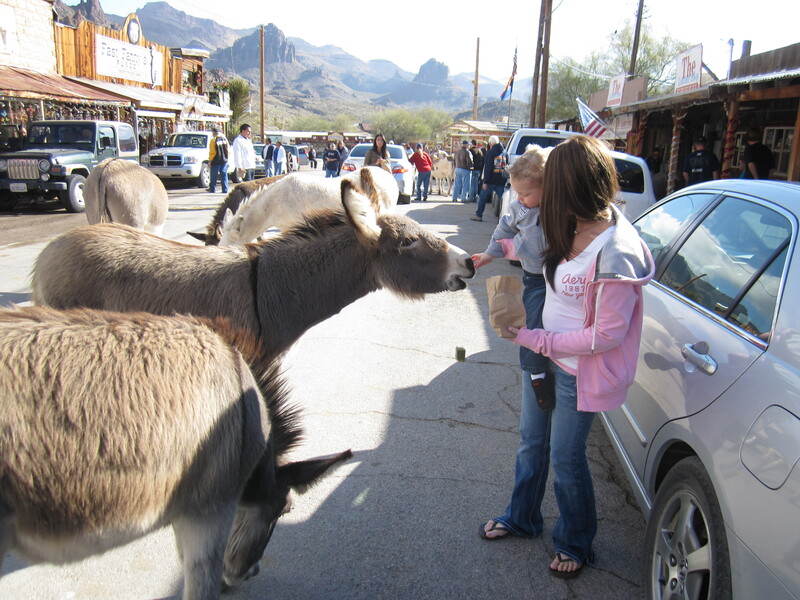 We also went over to Oatman AZ, it is right on Route 66 and it’s an old mining town that is getting over run with burrows but that is half of the fun. Here Talon is feeding the Burrows, but like the geese he likes the animals as long as you are holding him. 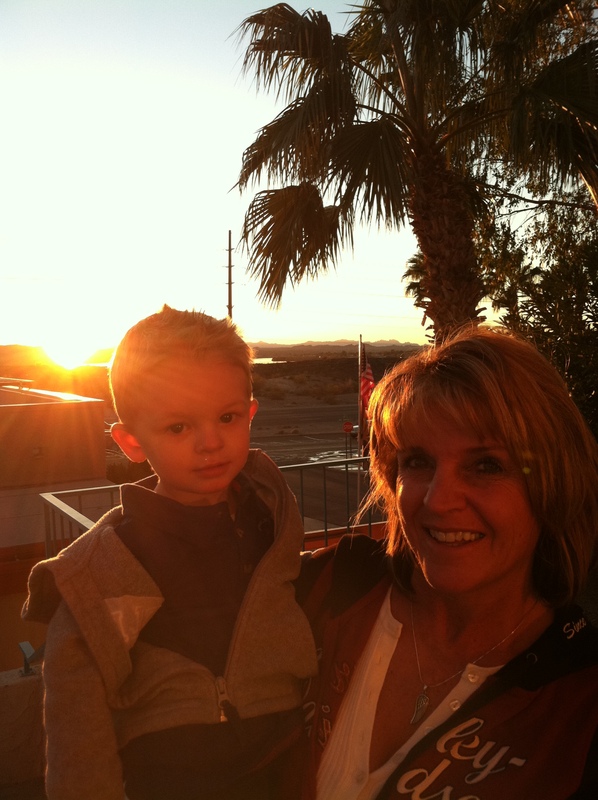 Great picture of Linda and Talon just as the sun was going down in Lake Havasu. 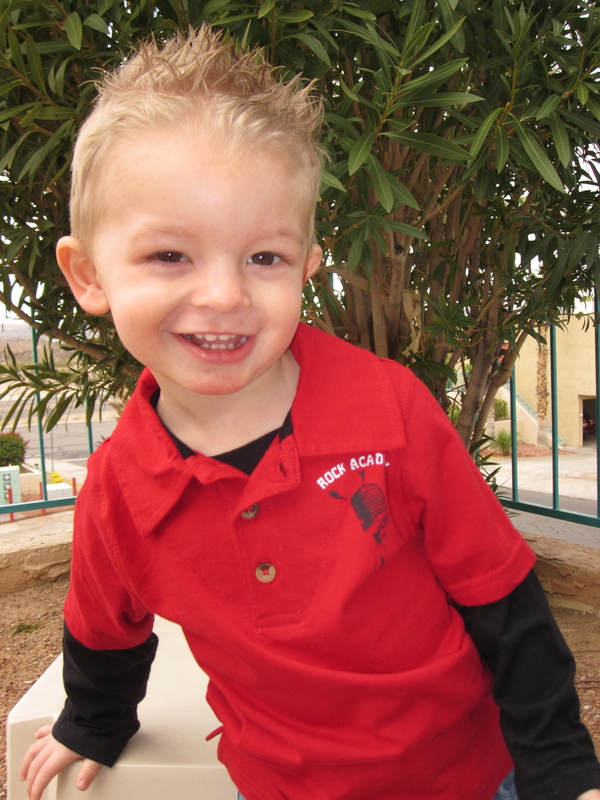 Talon had three Christmas’s this year one in Lake Havasu another one here in Mesquite and one in our home in Sandy. This kid has enough clothes and toys to last him until at least next year. Tonianne brought Talon down the condo for Easter again this year. 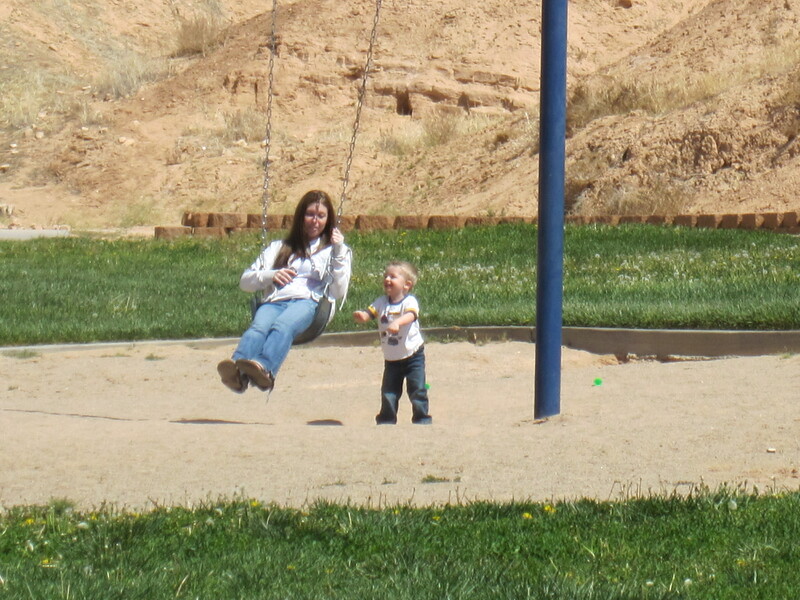 Here he is pushing him Mom on the swing. Good thing I took the picture when I did because when Tonianne came back it knocked Talon back about five feet. 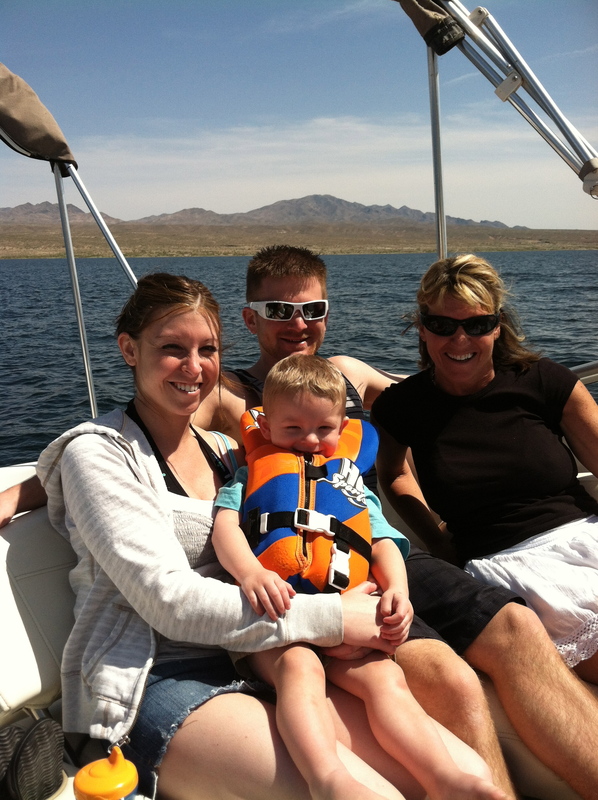 Here’s Toni, Talon, Jon and Linda on the boat. 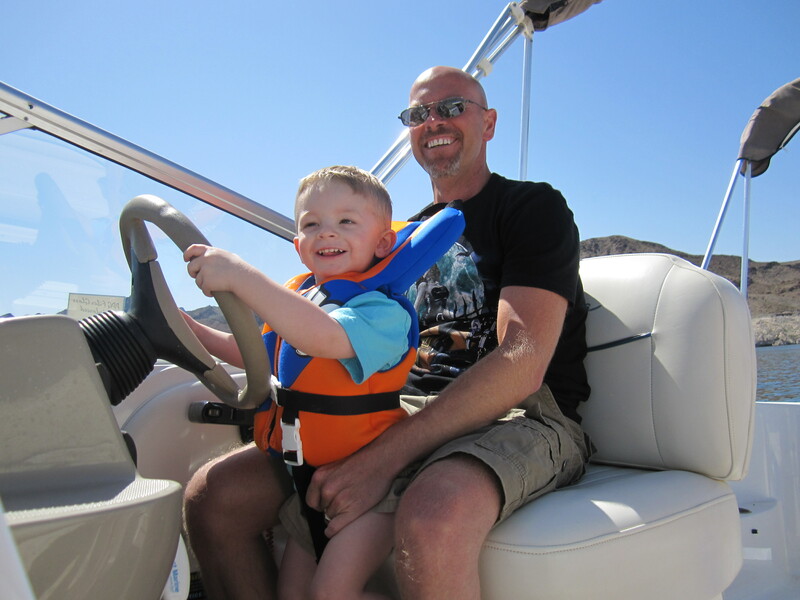 Talon loves the boat!!! Talon’s new title is “Captain” He took us all over the lake. It was so funny, Talon got so tired he fell asleep with his head against the steering wheel. 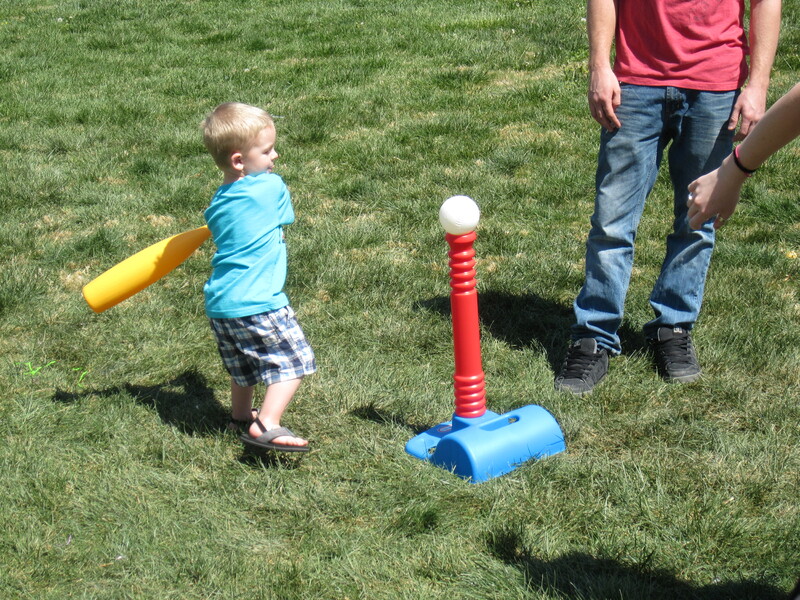 Talon is a lefty… he has great follow through on his swing. 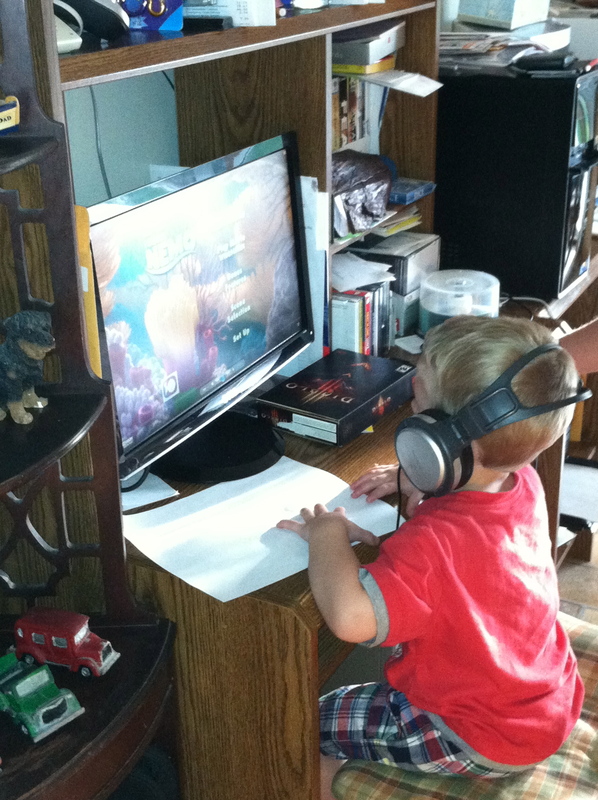 Benda has found a way to keep Talon busy and entertained… She just puts the headphones on Talon and loads a DVD into the computer. He sat there until he was ready to take a nap. 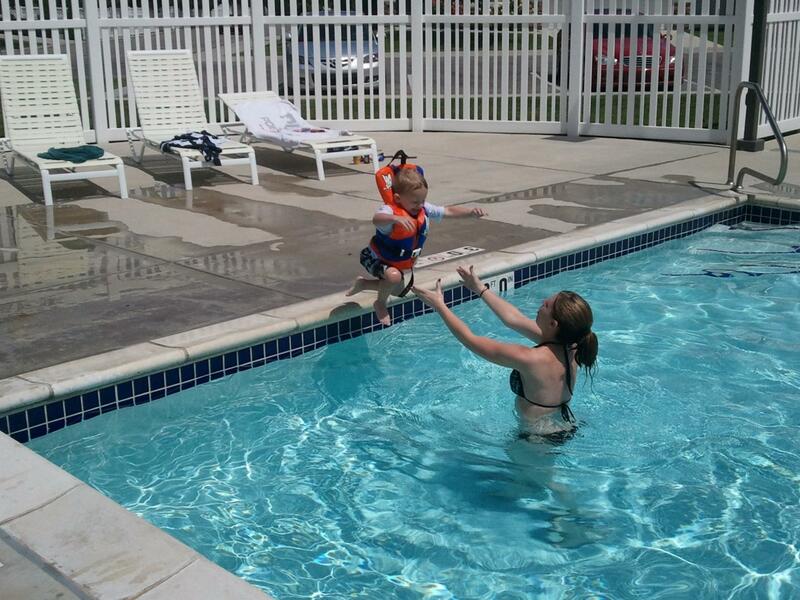 The pool is now open here’s an action photo of Talon jumping in the water. This is just one of his many jumps, Jon and Tonianne had to take turns because their arms were getting tired. This kid can play for ever and he seems to never runs out of steam as long as he’s outside and playing. Talon’s first camping trip. We went on our family outing at the Girl Scout camp just out of Heber City. 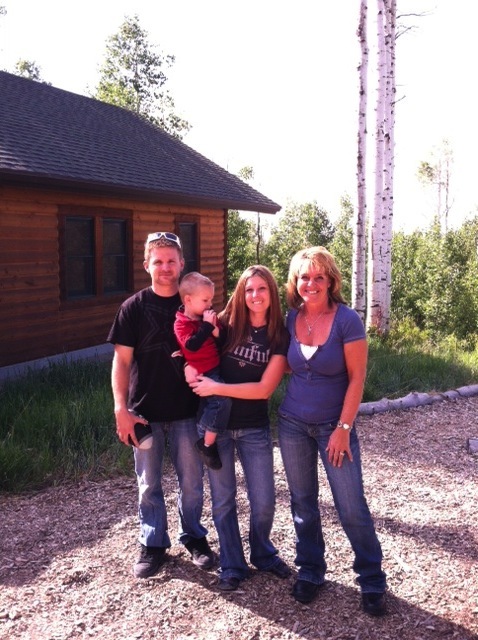 Here Talon is just outside of our cabin with Jon, Toni and Linda. Talon had a blast hiking all over the place, in fact he wore out both Jon and Toni so they had to call in the special forces… Sue’s grandkids. 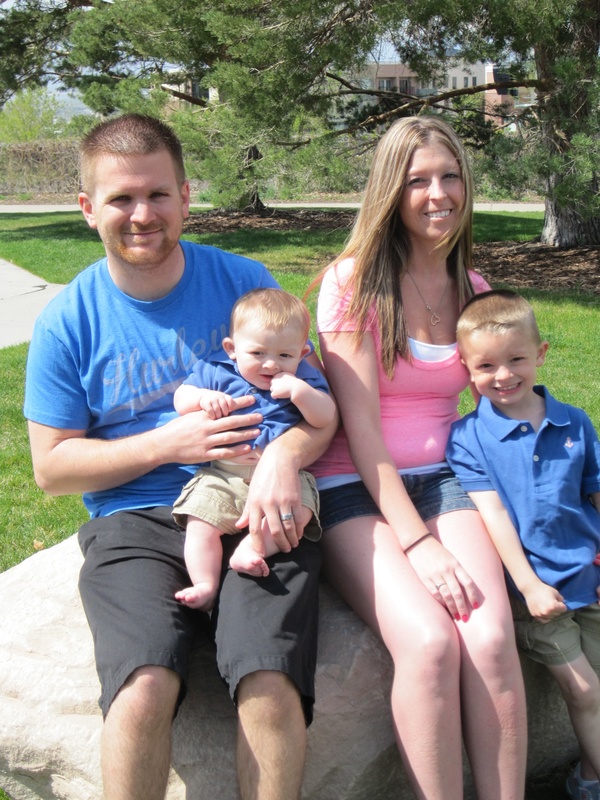 They ran and played all day until Talon just stopped and dropped in the dirt on Saturday. We knew it was over and it was time to go home. 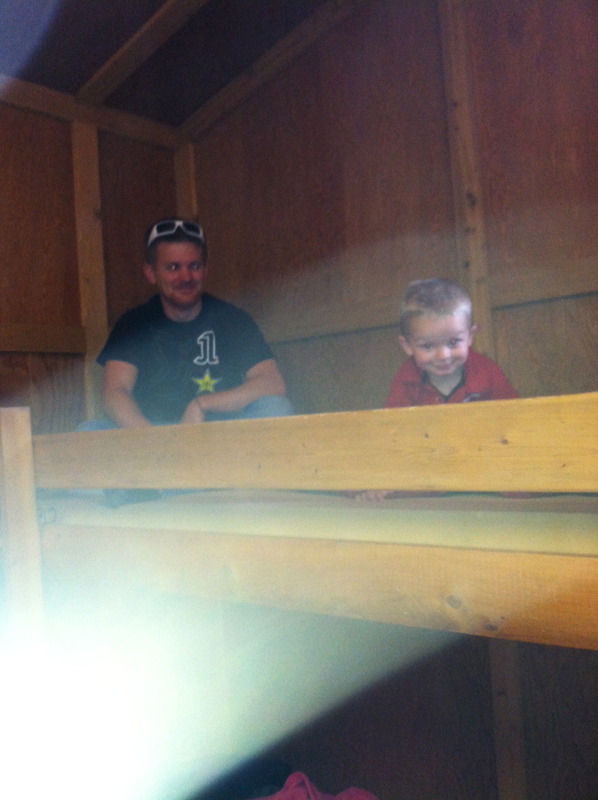 Here’s Talon and Jon in their bunk bed in our cabin. It’s not the greatest picture because of the lighting so you might have to click on it to see them. I can’t tell if Talon is throwing a curve ball or a slider either way he’s got some good form. 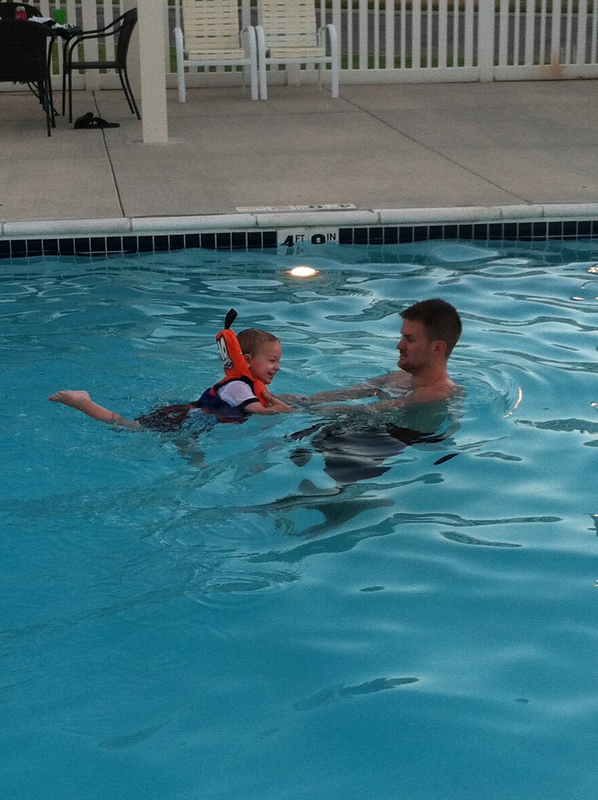 Jon helping Talon learn how to swim. The trouble with swimming is not the swimming part it’s getting Talon out of the pool that is the trouble. He could stay in there all day and night if you let him. 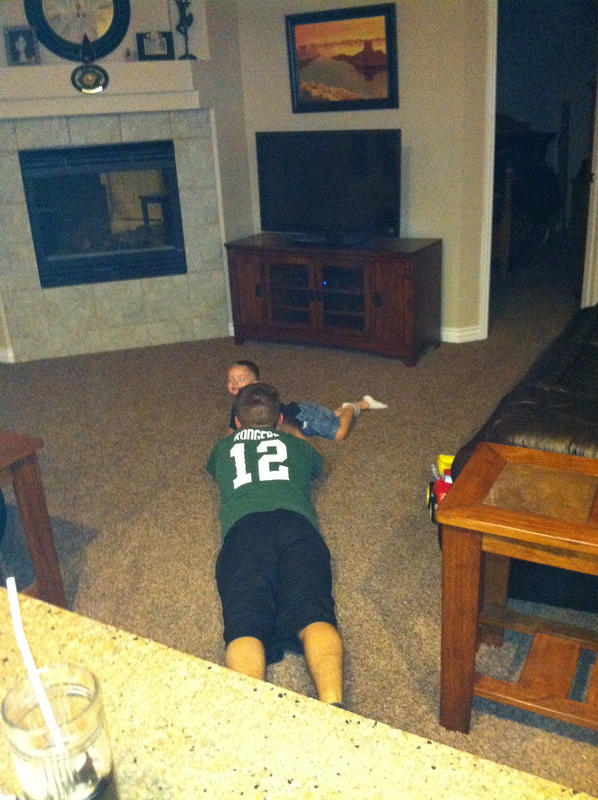 Talon and Jon wrestling on in the living room. Sometimes Jon wins and sometimes Talon wins either way it is fun to watch. I don’t remember what Talon was saying here but he was pretty passionate about it. 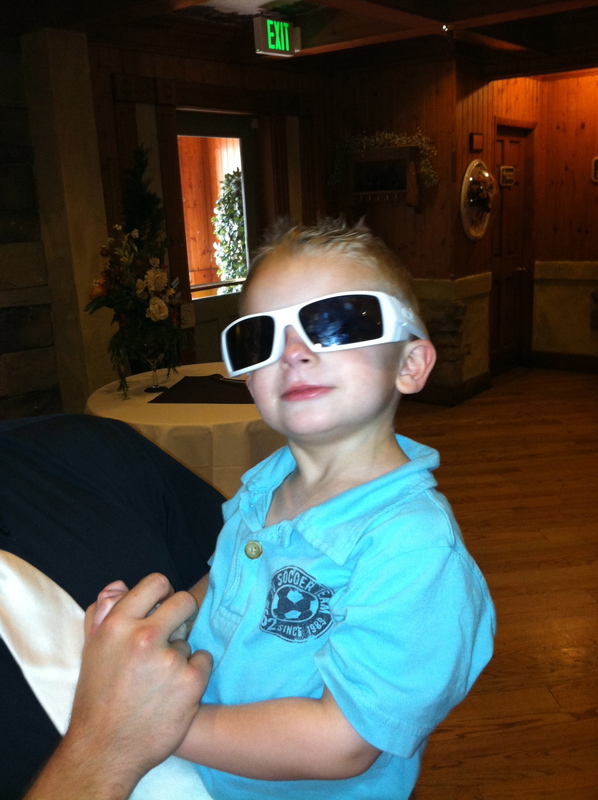 Talon just playing it cool. Looking for chicks at the wedding we were at. 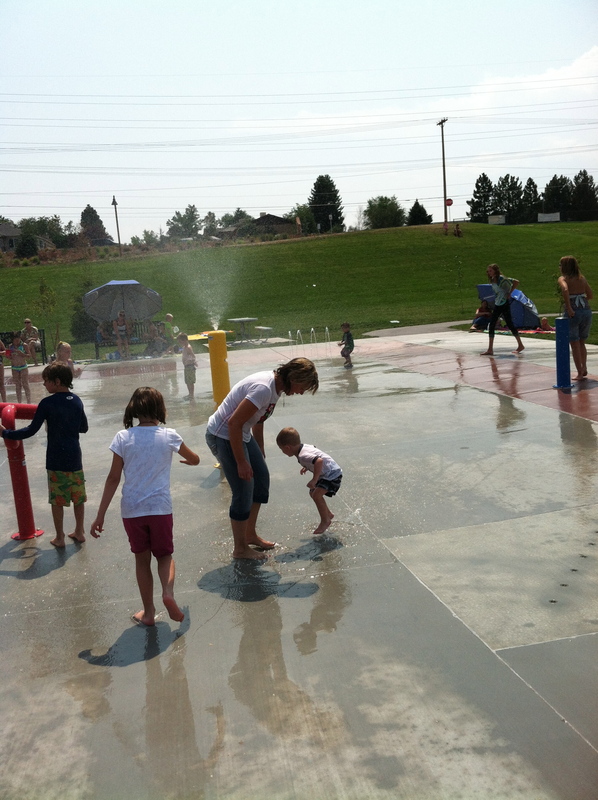 Grandma and Talon playing at the water park. It took about 20 minutes and Linda running through the water before Talon would go in. 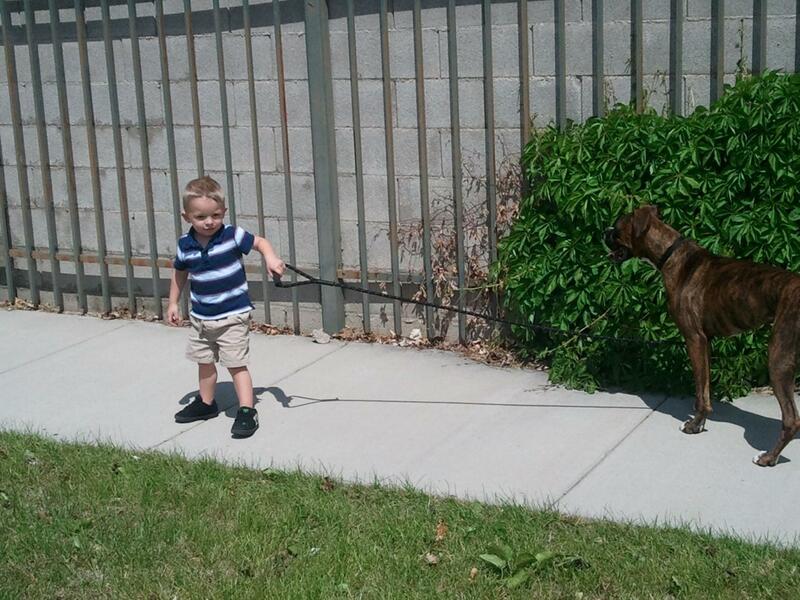 He’s not big on trying new things but after he started running though with Grandma in tow he didn’t want to go home. Grandma showing Talon how to cup water in her hands. He thought that was so cool. 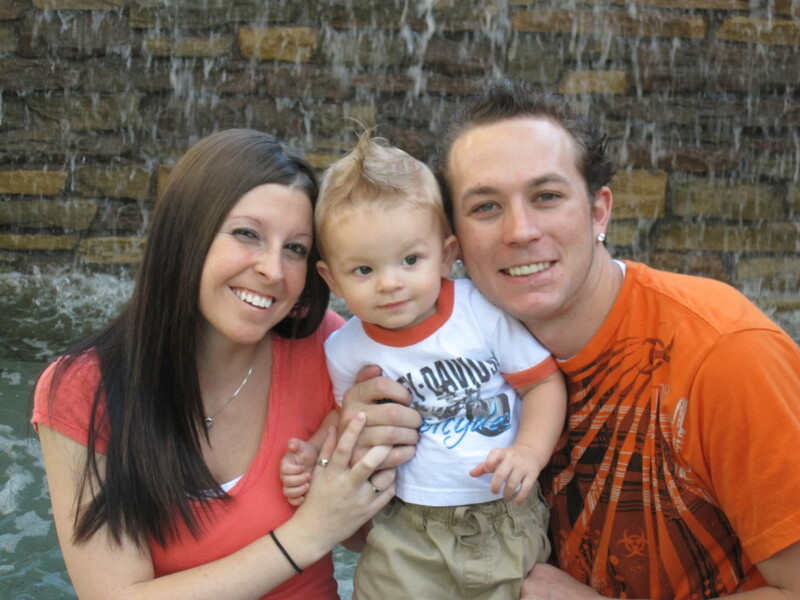 Finally Talon will go on rides maybe it’s because is Mom and Jon are with him. 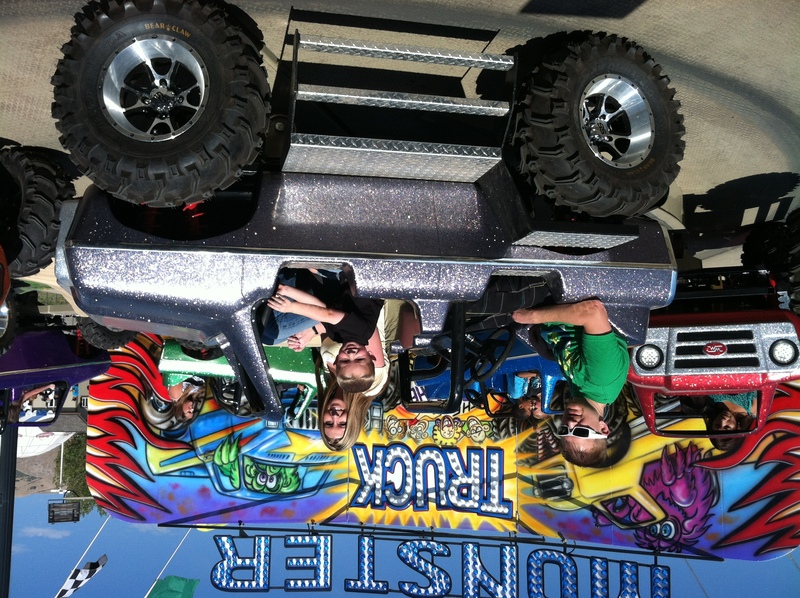 He had a great time at the Salt Lake City Fair this year he loved the Moster Trucks and the big yellow slide. 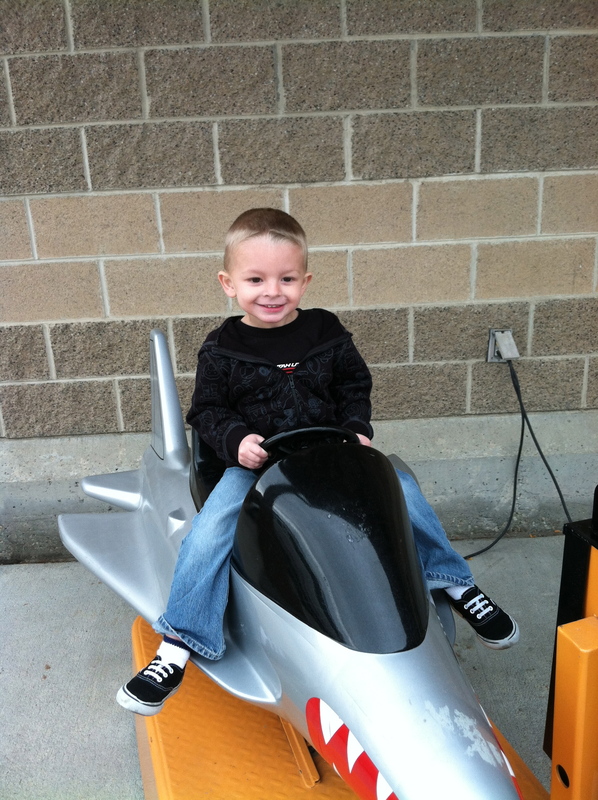 I think by next year he will be ready for Lagoon and then Disney Land…..
Talon is getting so big he is almost 3 and looks like he might want to be a pilot. 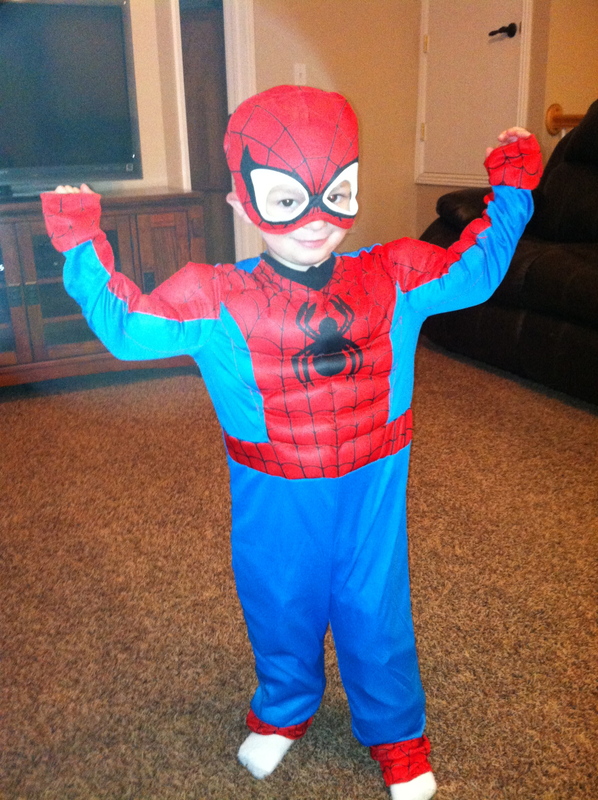 I think if you told him he could fly a plane in his spiderman outfit he would start flying lessons right now. 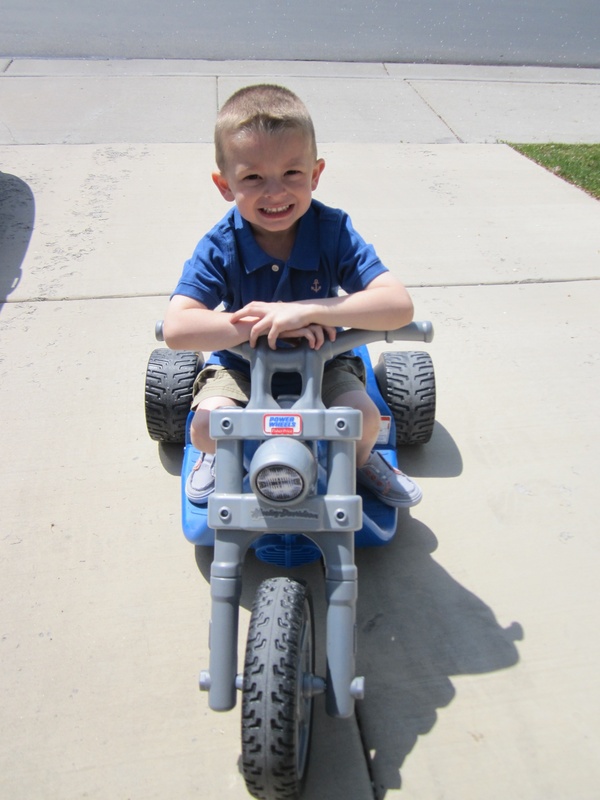 Talon’s Birthday and here he is Riding his new bike he got from Grandma and Papa but he had to have a Spiderman helmat. 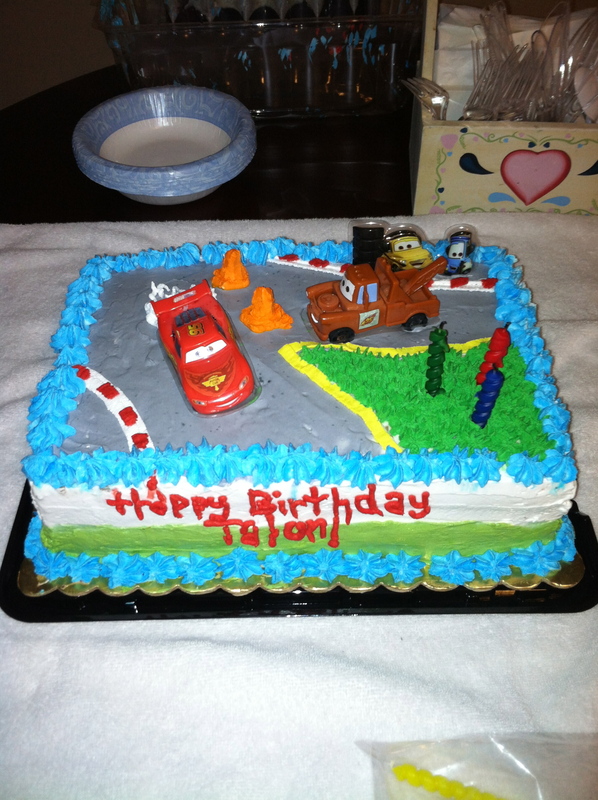 His Birthday cake with three candles. I think with everything he got from all of his great grand parents, Jon’s parents, his Aunt’s and Uncles, Tonianne and Jon and Linda and I. He had a pretty good day. 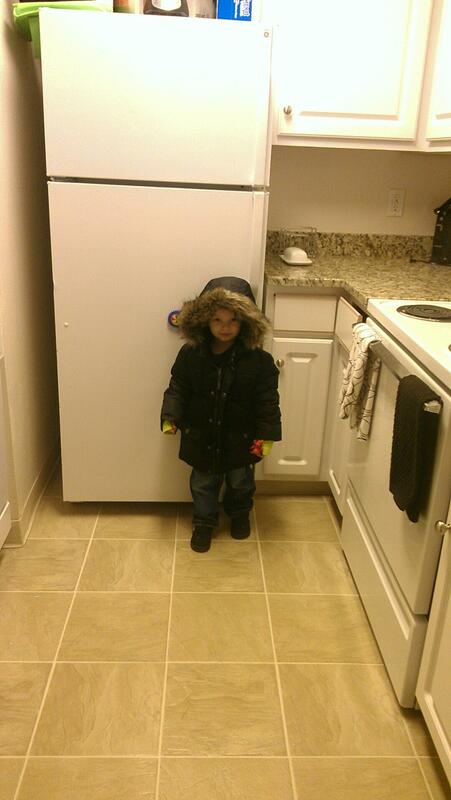 You may have to click on the picture to see it better but this is Talon getting ready for our first Snow storm. He loves the snow!!! 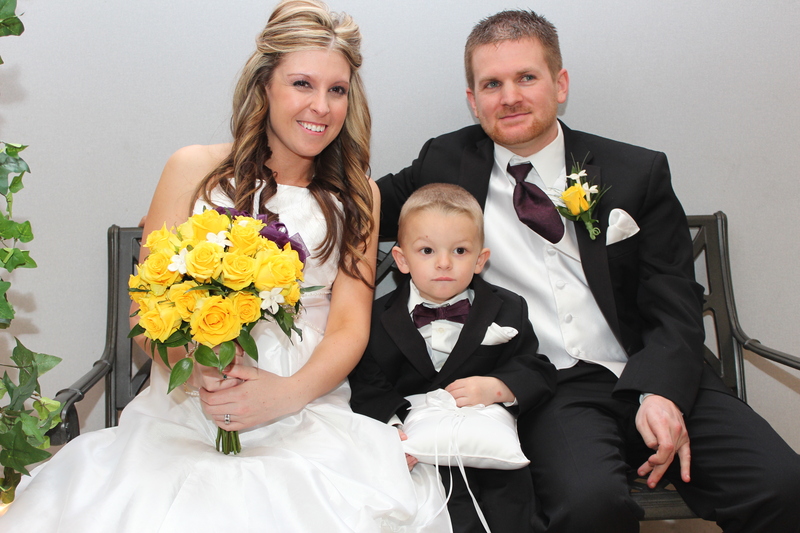 Here’s the new family picture of Tonianne, Jon and Talon. 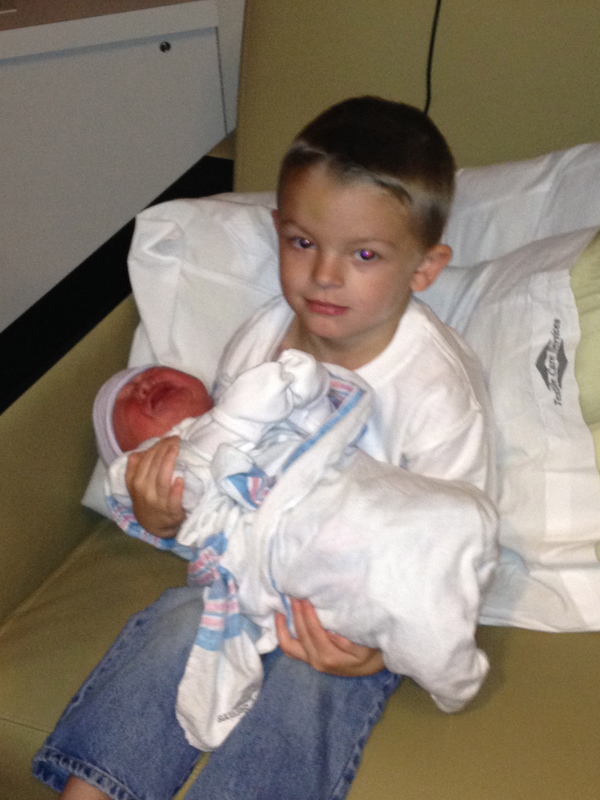 Talon Holding his new baby brother Mason. 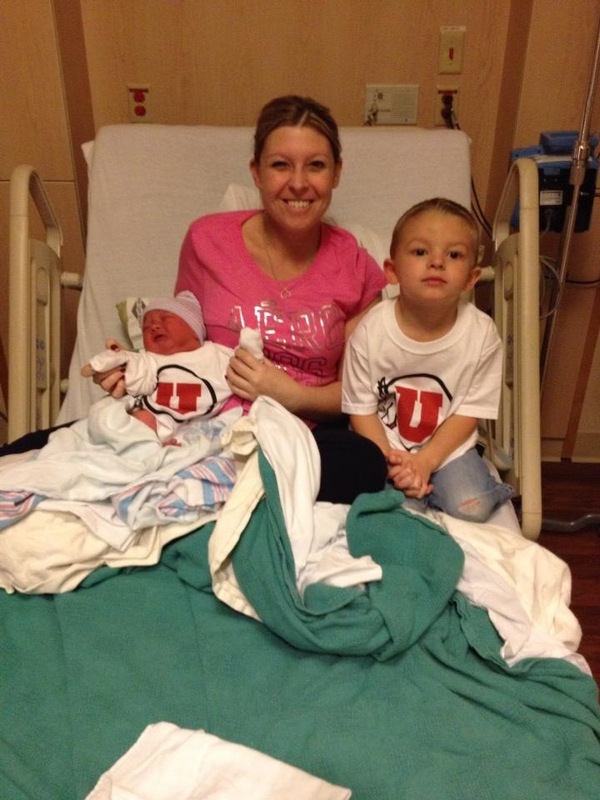 Talon, Tonianne and Mason with their new Ute shirts. Go Ute’s!!! 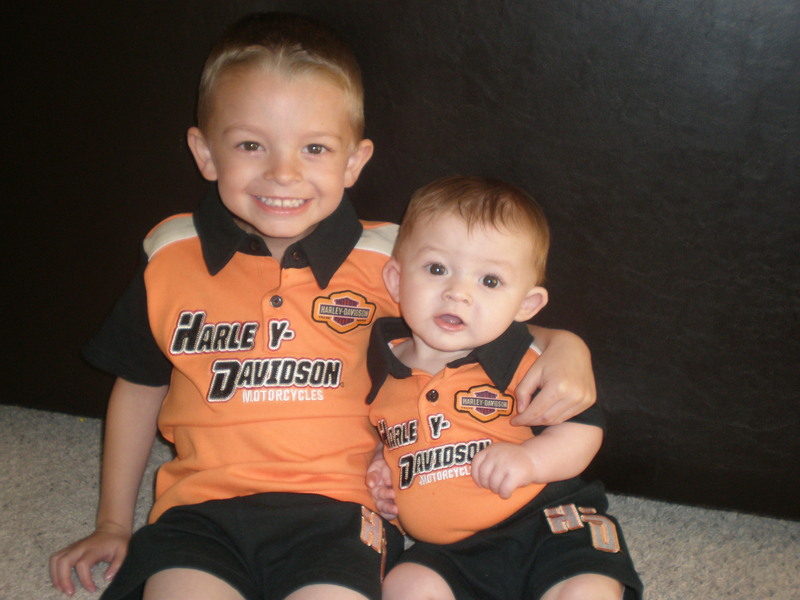 Great picture of Talon and Mason in their Harley Davidson clothes. 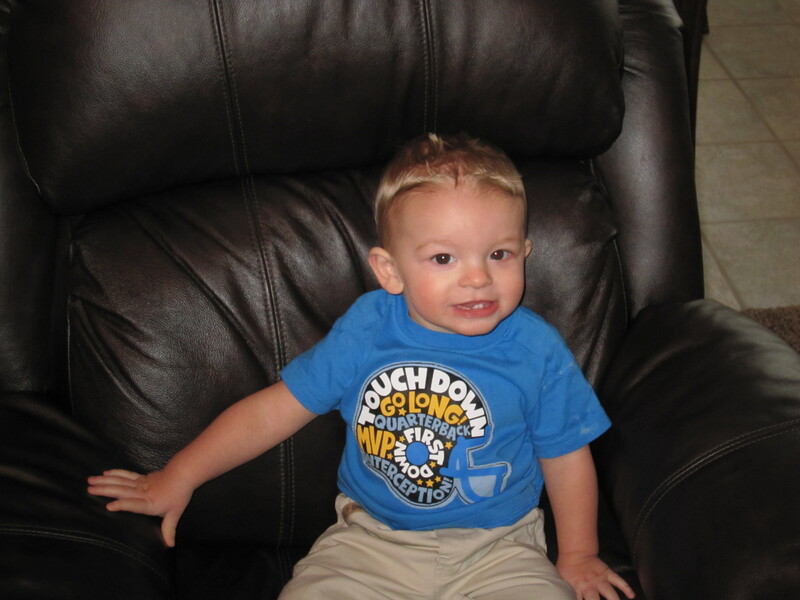 Talon is really getting big. Look how tall he’s getting. 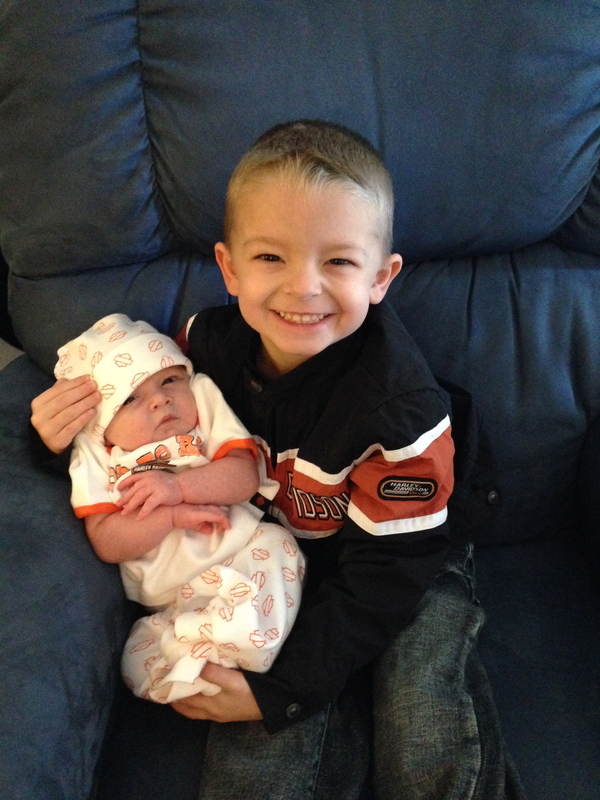 Talon is the best big brother any kid can have. When Mason starts crying Talon either starts talking to him or my favorite he sings to him, I have to tell you that is the cutest thing you will ever hear. 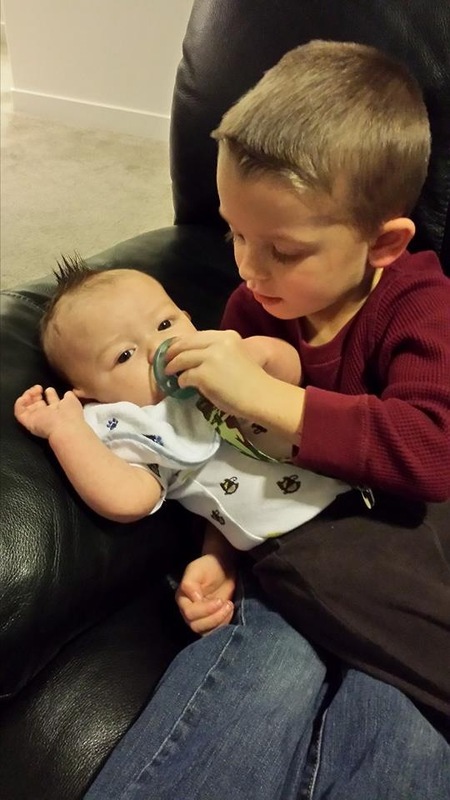 Talon has really grown up with the addition of Mason to the family. 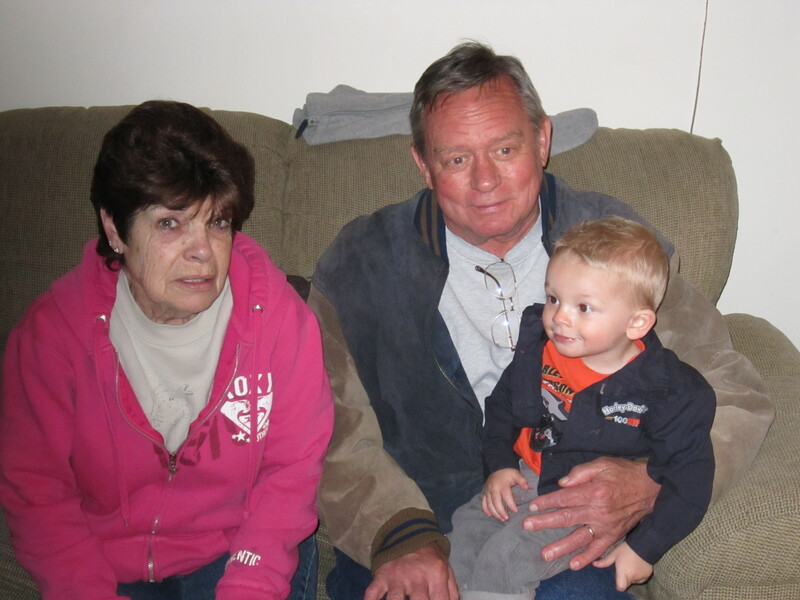 I guess it’s time for another one grand child Mom and Dad. 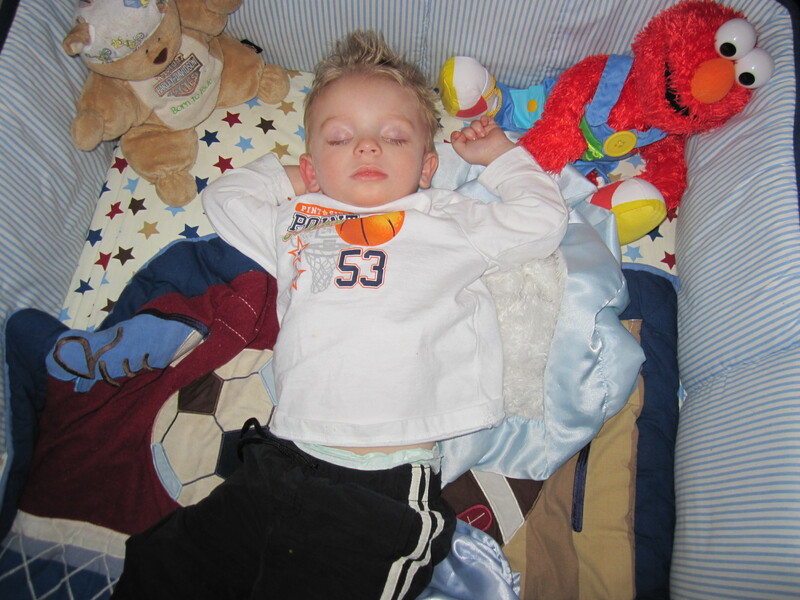 Talon is only 4 and he’s already sleeping like a teenager. A bomb could go off and he wouldn’t know it. 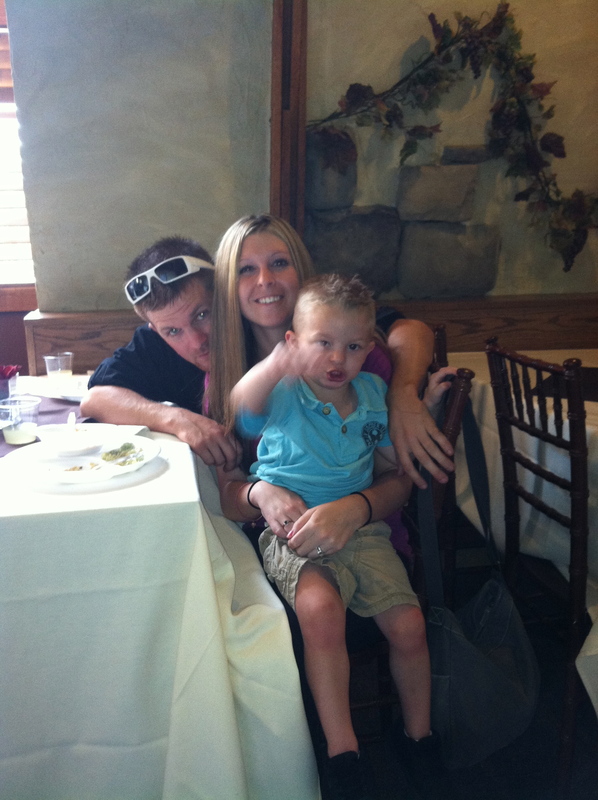 Tonianne and Jon ganging up on poor Talon. It took Talon a while to start liking the rides at Hollywood connections but after he decided they were pretty fun we could not get him to come home. We were there five hours. 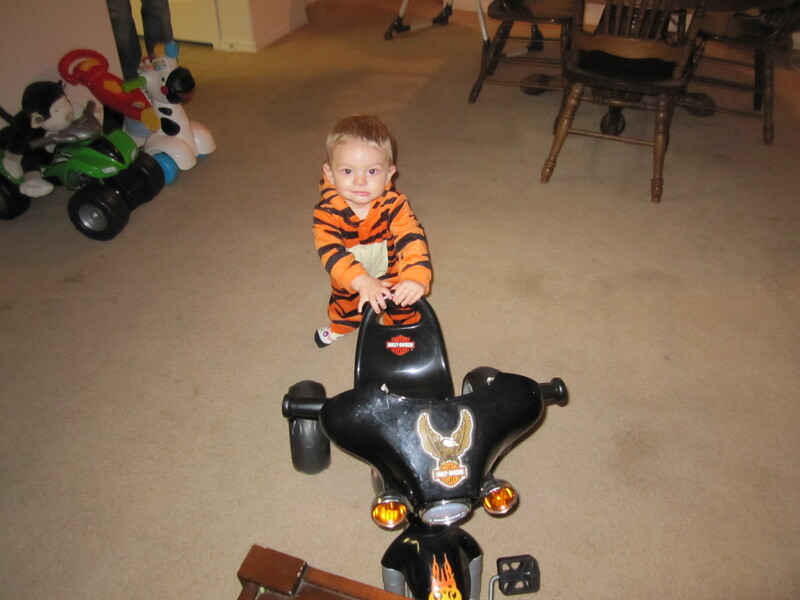 Talon riding his first motorcycle!!! so it has training wheels it is still way cool. 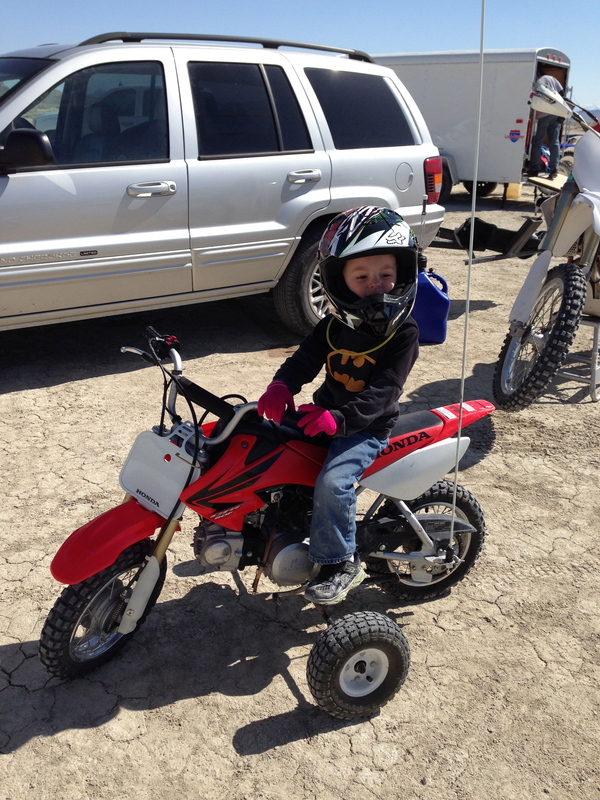 Jon took Talon out for an over night camp out in Dele and Talon got to ride the motorcycle the next day. When Tonianne came to see Talon ride he said “Mom I can’t look at you when I’m riding because I need to watch where I’m going” He is getting so big. Next the think the training wheels come off of his peddle bike. Bring on the road rash. 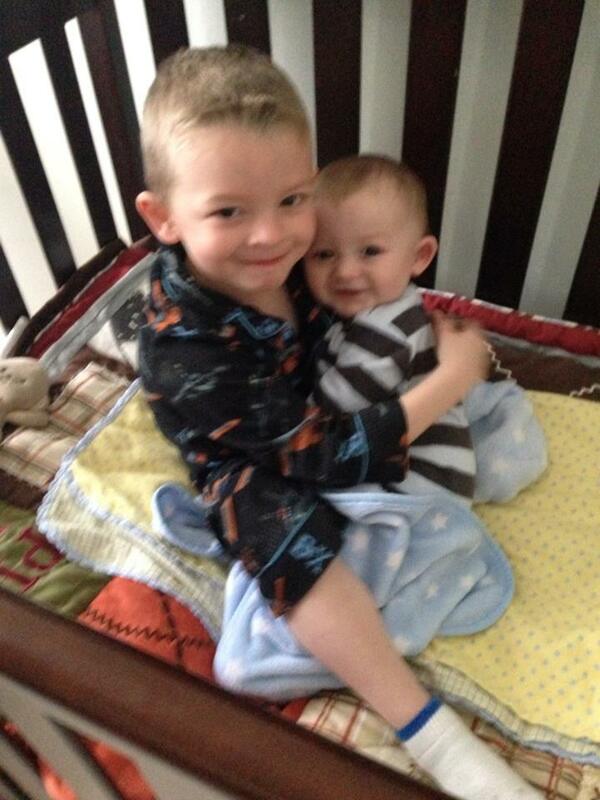 Mason woke up and was crying so Talon did what he used to do so well when he was little and climbed in the crib to hold Mason. He is a very sweet brother with a huge heart!!! 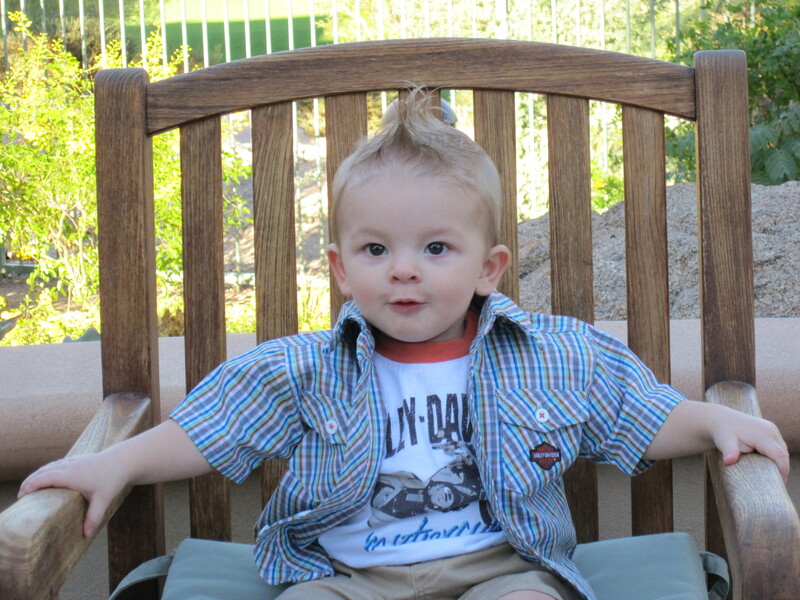 Talon just hanging out on his Harley. I think he needs a new one he is just getting to big and think he needs one with more speed!!! 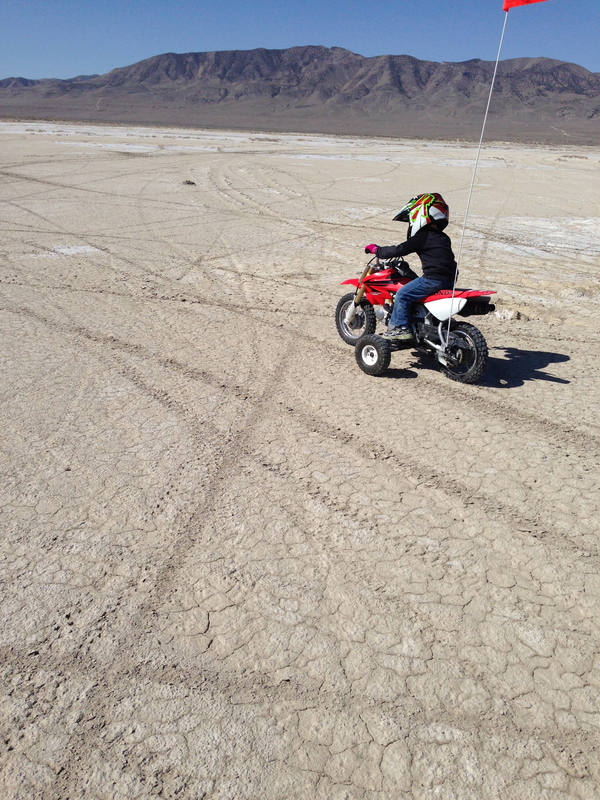 I can see a small 50 cc or 80 cc in his future. First Family picture Mason was not feeling well but it is still a good picture of them all. 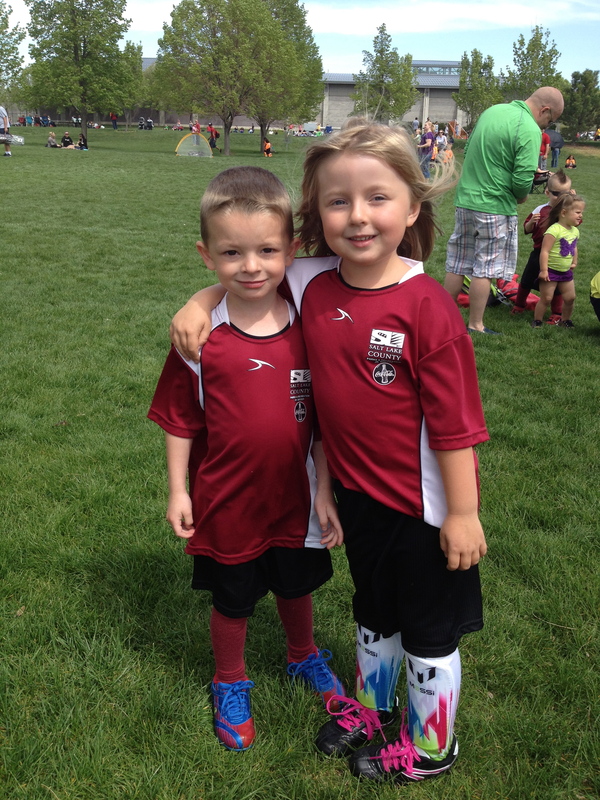 Talon and Meg’s first soccer game of 2014. It’s going to be a great year for them because they won their first game. 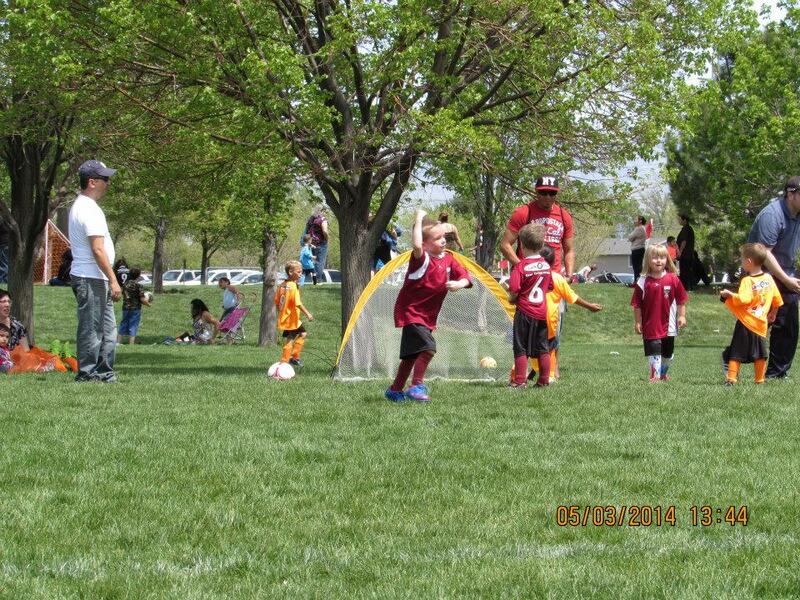 The score was 6 to 4 and out of the six goals Talon scored 5 and Meg scored the other one. 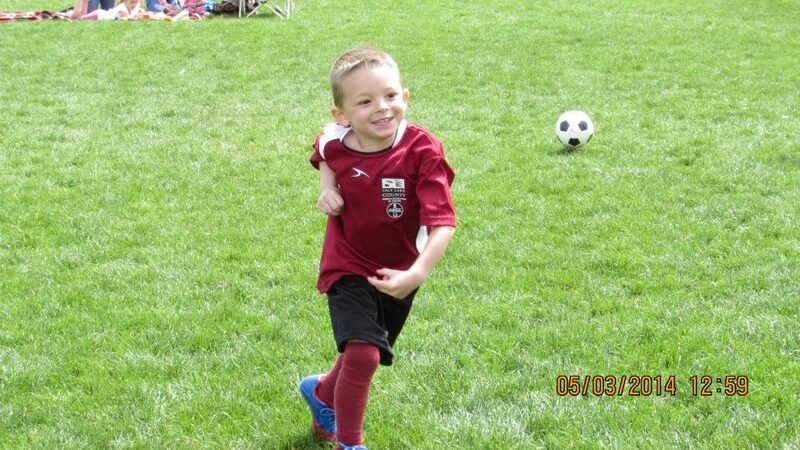 Here is an action photo of Talon chasing the ball down he scored his 5th goal right after this shot. It was so funny because after each goal he had to run over to me and give me a high five. 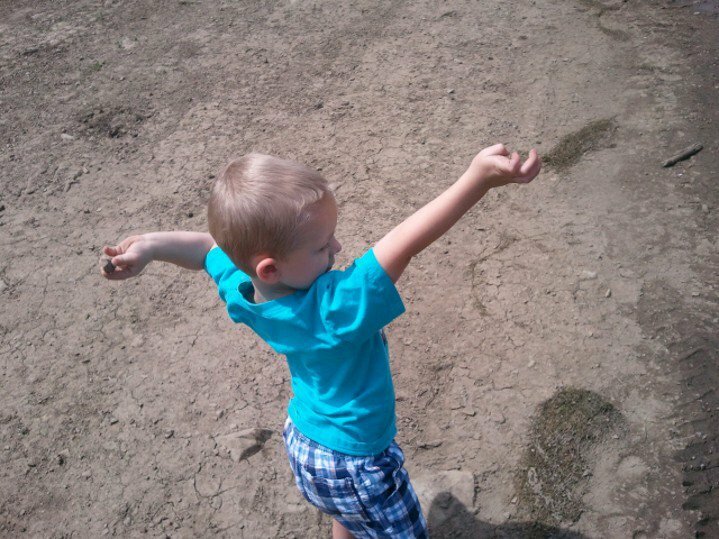 This is Talon’s victory Dance… It starts out with two hands in the air and ends with a fist pump.. He is such a good boy. We just love him so much. 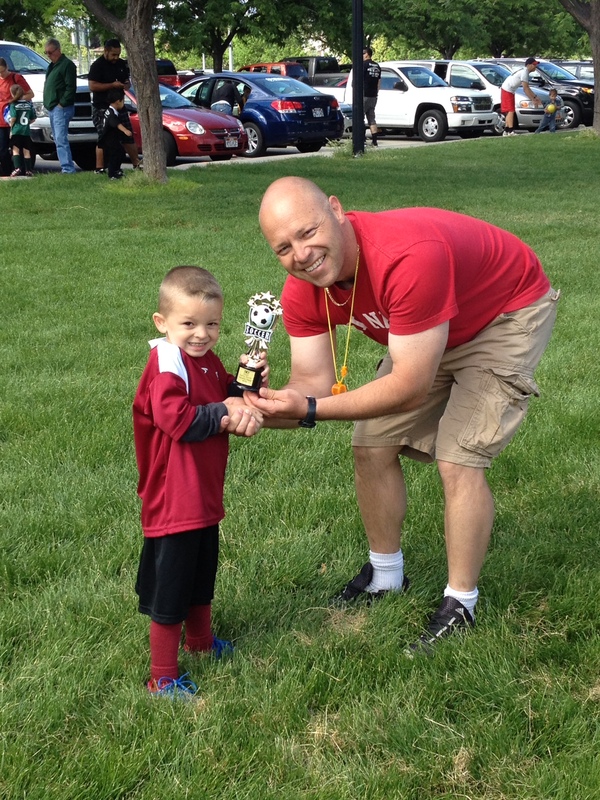 Talon getting his trophy from his coach. 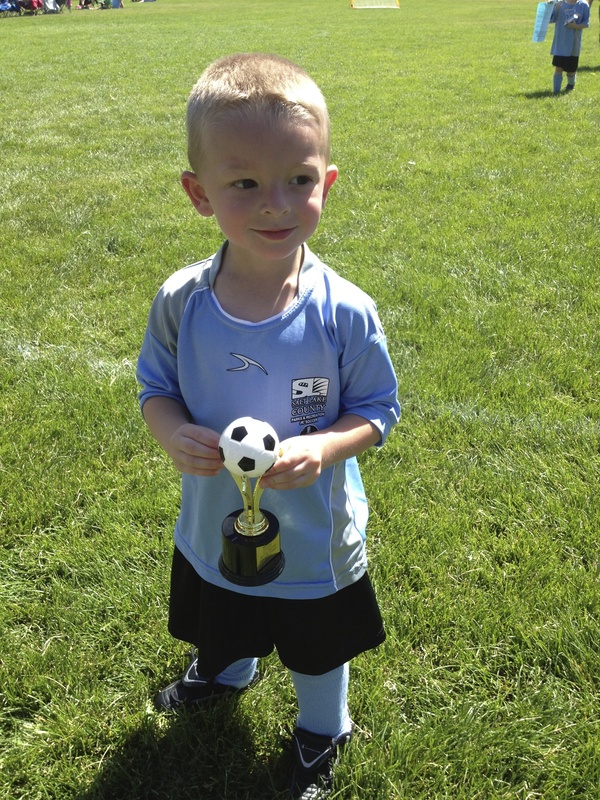 His coach said get use to getting trophy’s you will get a lot more, you are a natural. 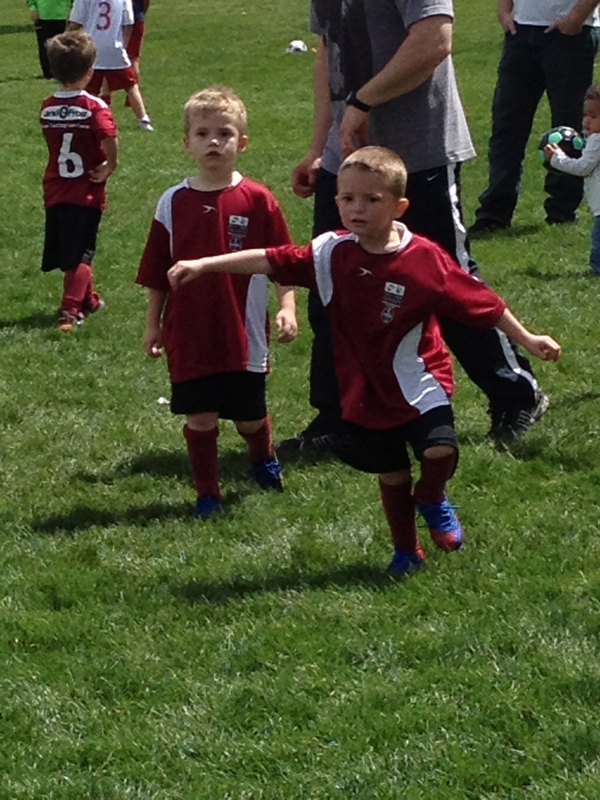 Talon did score seven goals today in their last game. 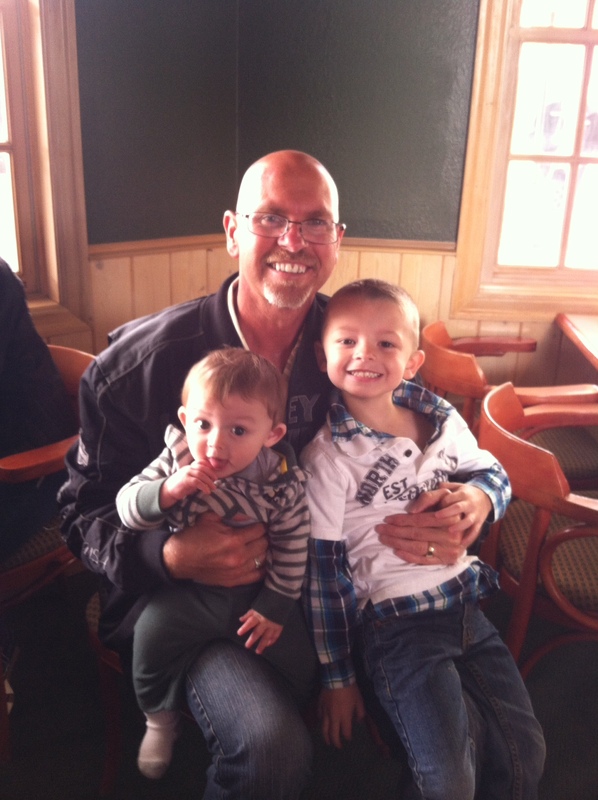 Father’s day with my grandson’s… Love this picture. 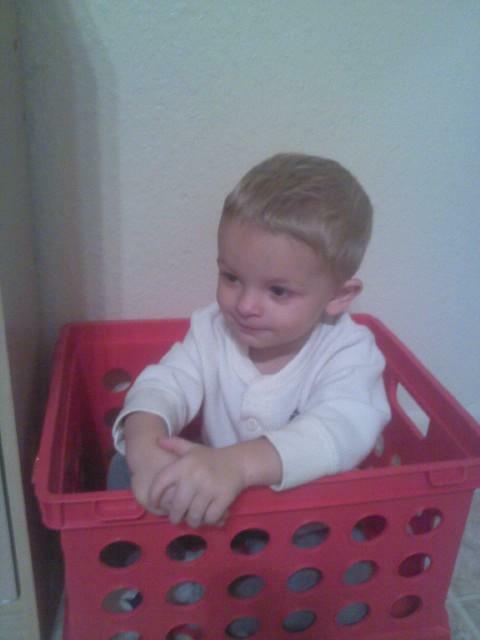 Talon is just so smart and he picks things up so fast. 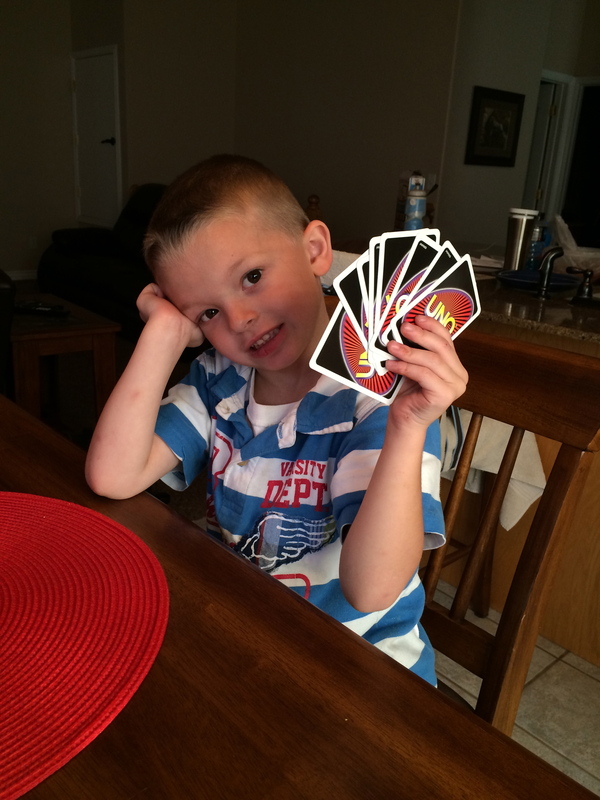 We taught him how to play Uno and he was kicking our butts from then on. He is an amazing kids. 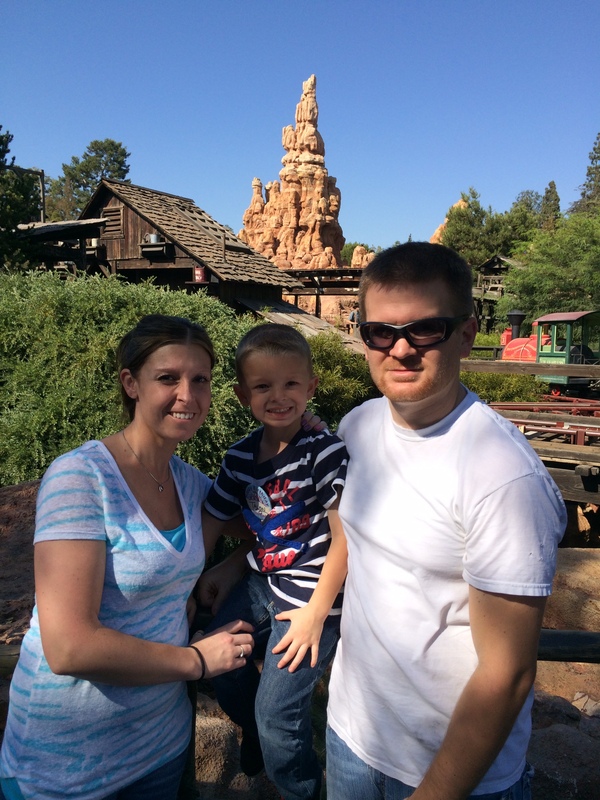 We took Talon and the family to Disneyland for his fifth birthday. He had a great time and loved every minute of it. 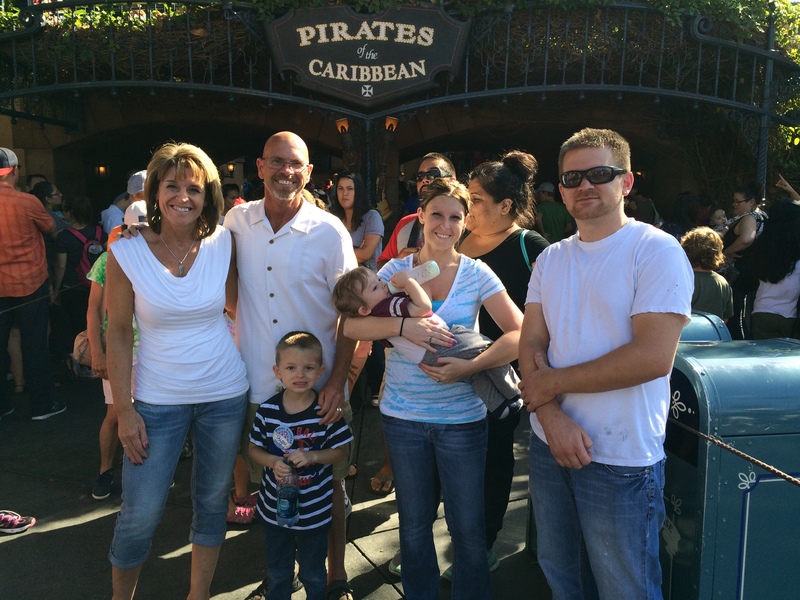 Here we are at one of my favorite rides Pirates of the Caribbean. Here he is just before we got on Splash Mountain. He liked every ride we went on except for Space mountain because it was dark and they had scary things out because it was Halloween in the park. Other than that he did fantastic for a five-year old. Here we are at California Adventures. 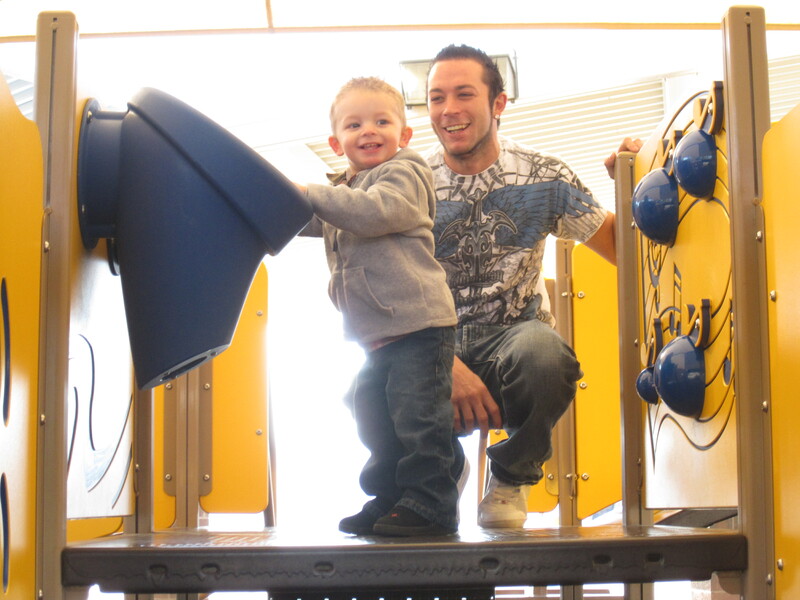 They have a lot of ride for Talon to go on here and he loved it. 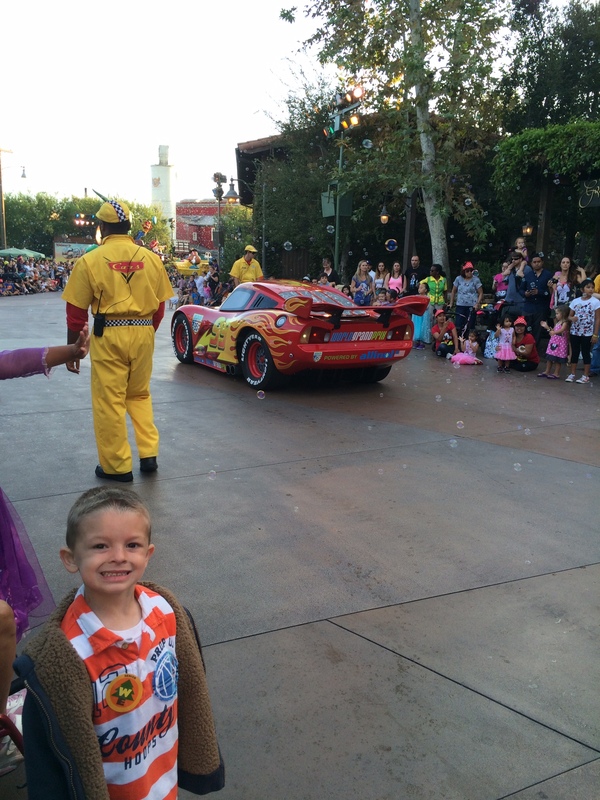 Talon’s favorite part of California Adventures was the parade because he saw Speed McQueen!!! He was so funny as soon as he saw Speed McQueen he said “No Way it’s Speed McQueen” it was so funny how excited he got. It was between Sea World and Legoland for Saturday. 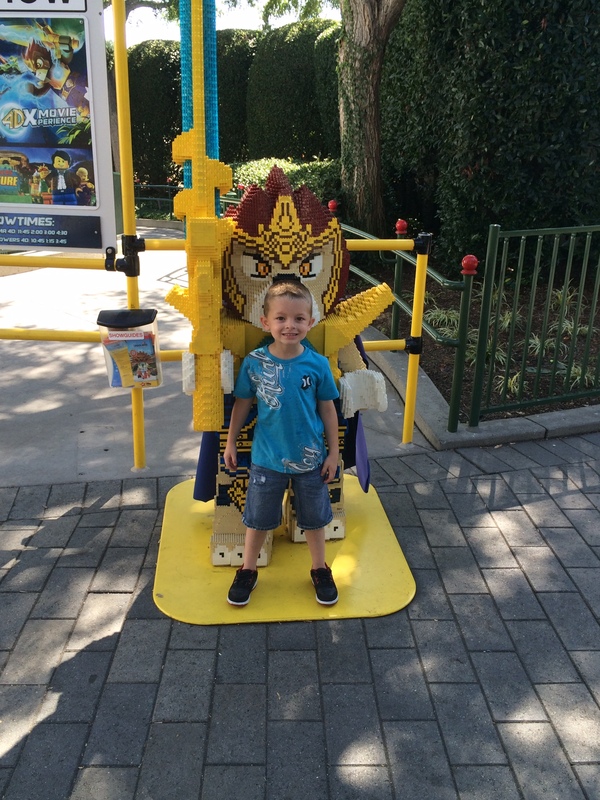 Talon picked Legoland and we were glad he did. I had no idea they had so many rides there that were just his size. 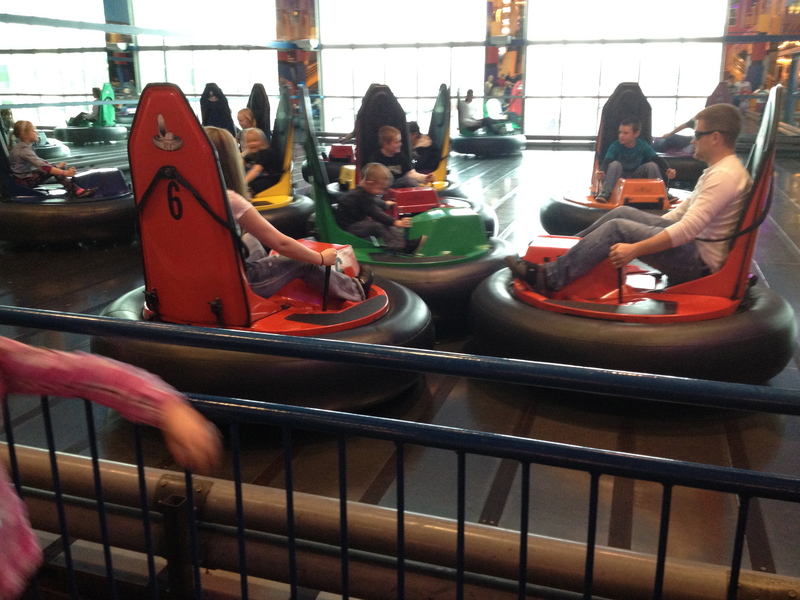 In fact there are only two rides in the whole park that he could not go on. I think next time I would spend two days in Legoland. It would be so nice if they stayed this young for ever.